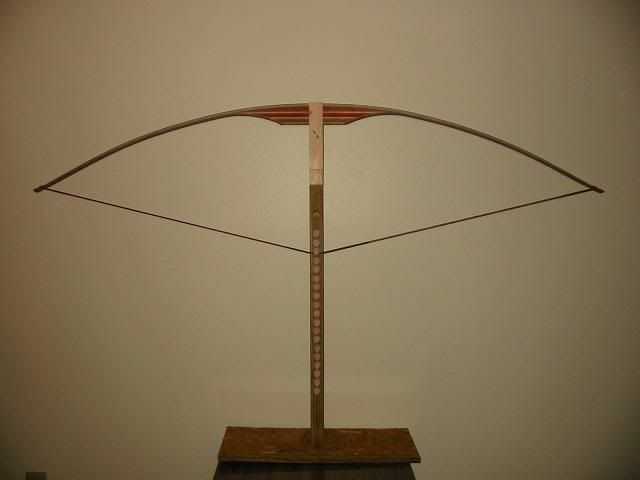 I build my first bow back in 1988. 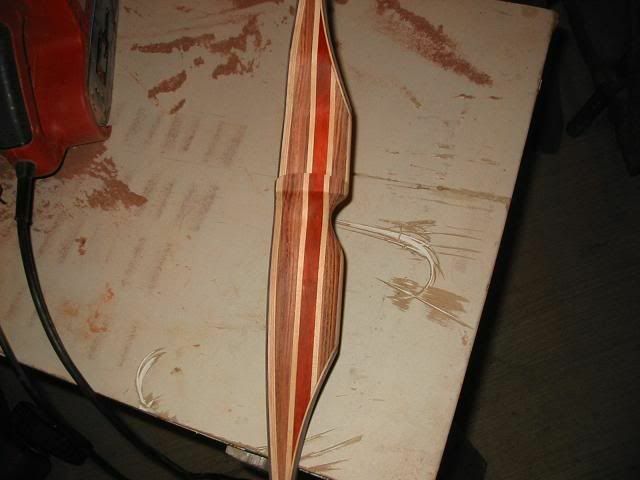 Bow building a a great hobby and rewarding. 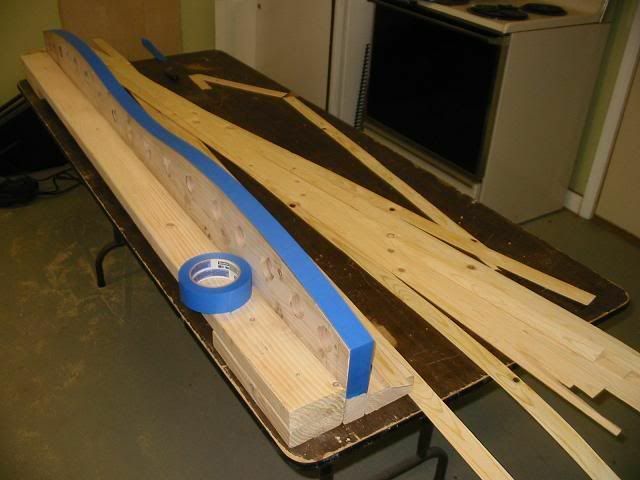 Here are the steps in making this bow for my son. I am not an expert by any stretch. 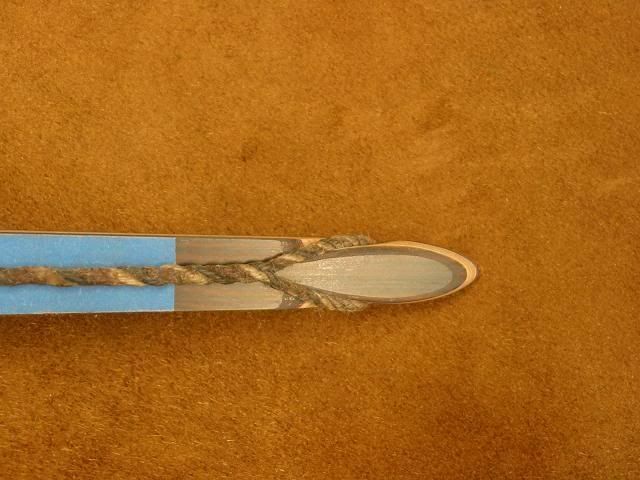 This bow will be a reflex/deflex Long bow. 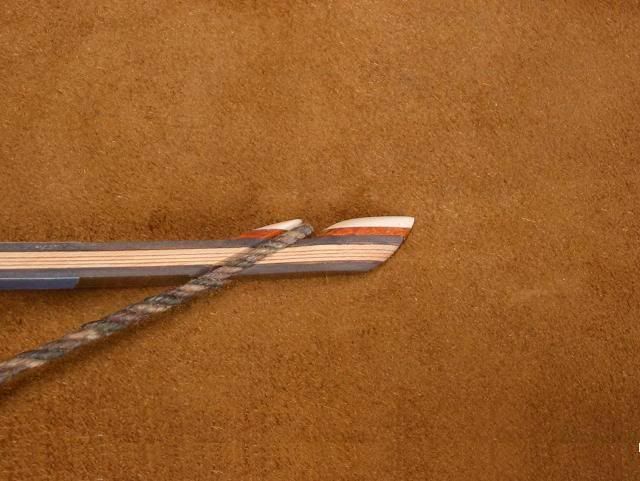 It is a hybrid combination of a longbow and a recurve. 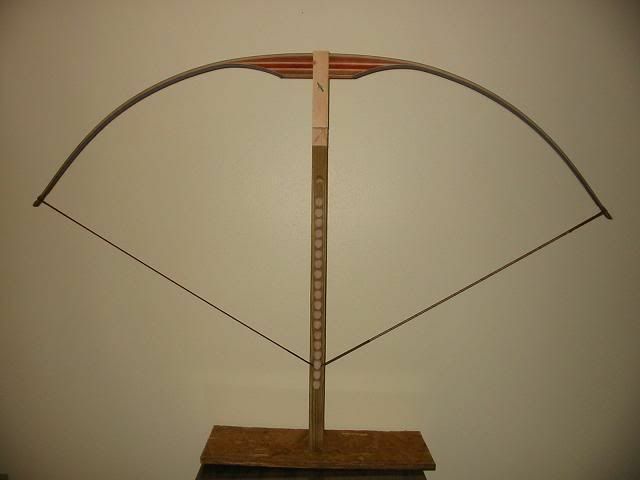 Longbows are typically straight when unstrung and recurves are still curved even when unstrung. 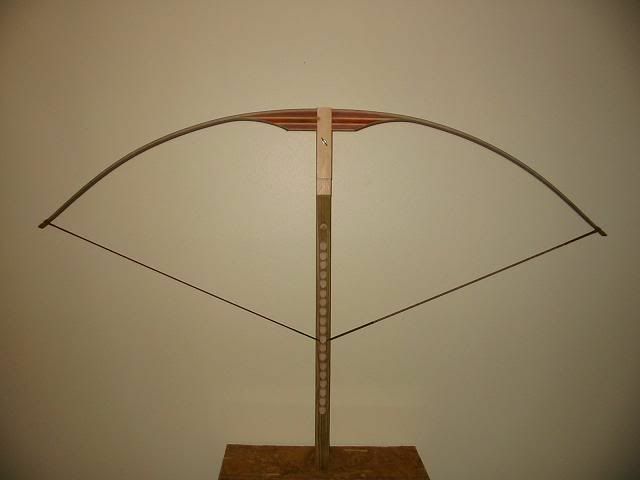 This bow will look sort of like a recurve while unstrung and like a longbows when strung. 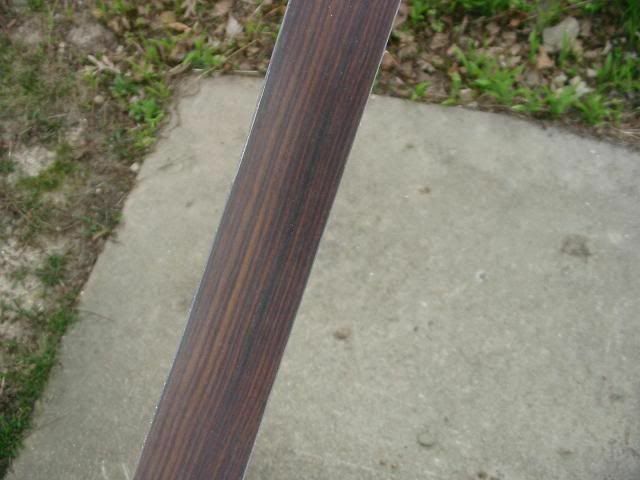 The woods I am using for Josh's bow are the same ones I use to make knife handles. 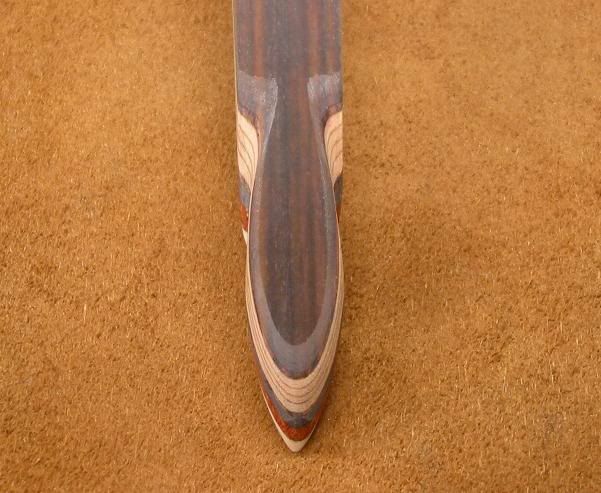 For the most part, they are South American hardwoods. 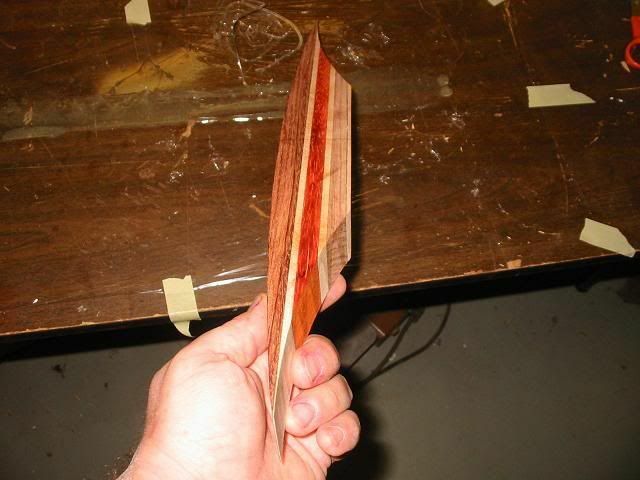 The riser will be made from Bubinga, Bloodwood and good old American hard rock maple from a tree my Dad cut many years ago. 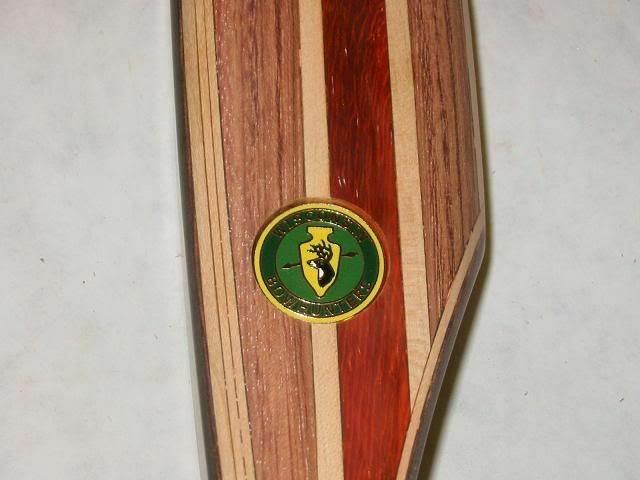 Sort of a legacy piece of wood, cut by my Dad, Made into a bow by me and finally used by my son. 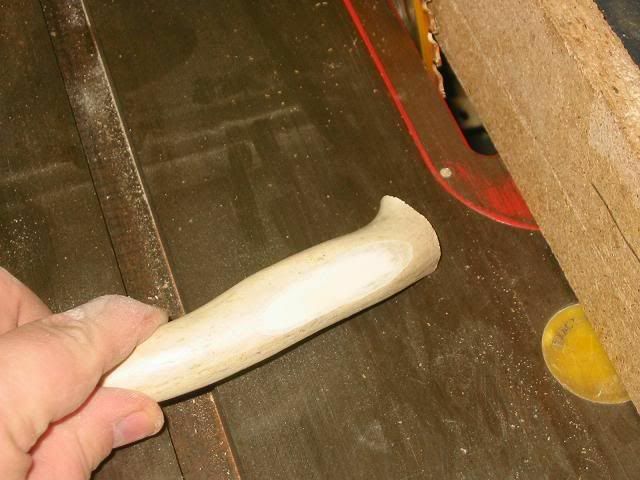 I will also use some of the Maple in the limbs. this is the order in which I will stack the layers. 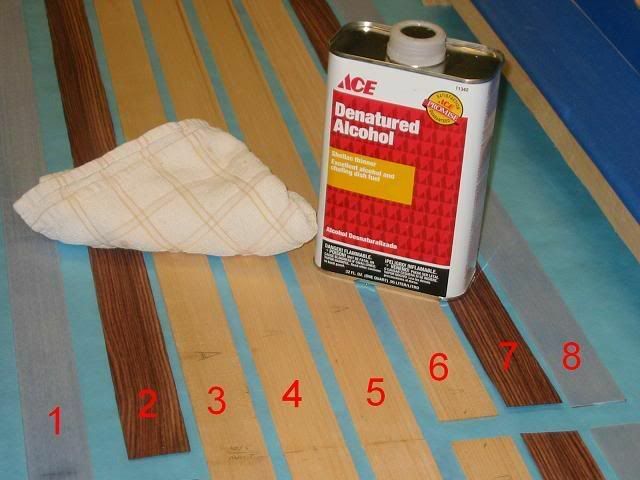 Most S.A. hardwoods have oils in them that make gluing difficult, so I use acetone to clean and degrease. Blood wood and purple hear are some of the oiliest. 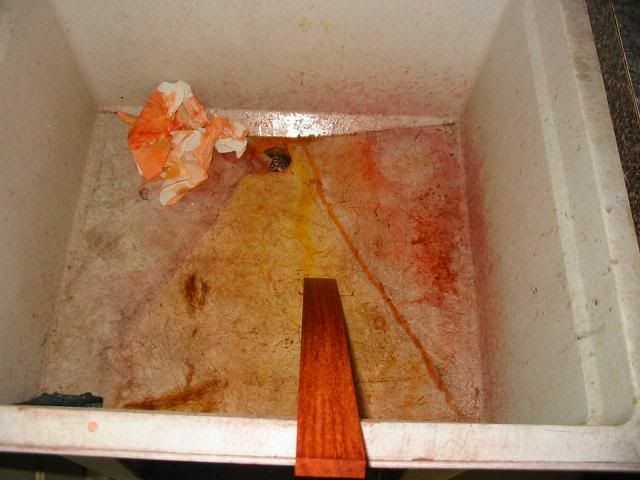 You can see the orange oil in the basin of the sink. It took a long time to clean that sink. I should have sprayed it with pam first. 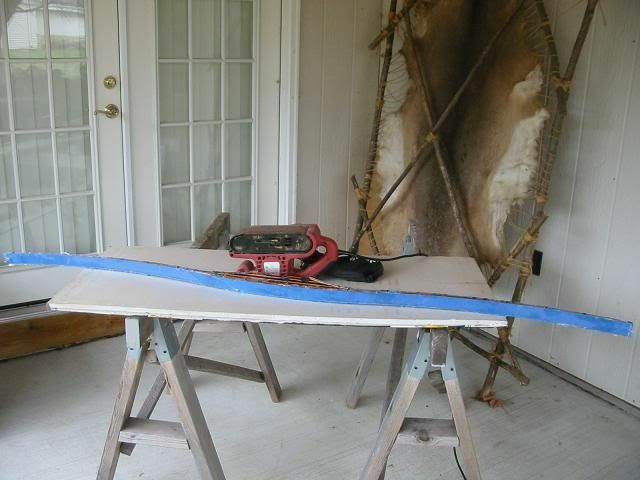 Once cleaned, I used a hacksaw blade as a scrapper to rough up all the gluing surfaces. Epoxy does not like smooth surfaces. 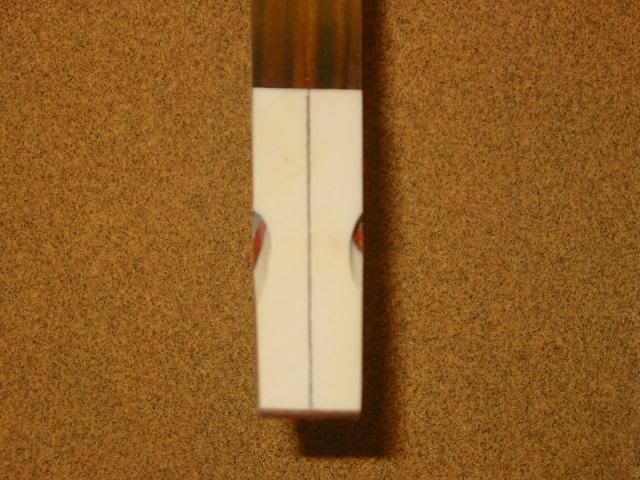 The glue I am using can be purchased at a number of bow building web sites. 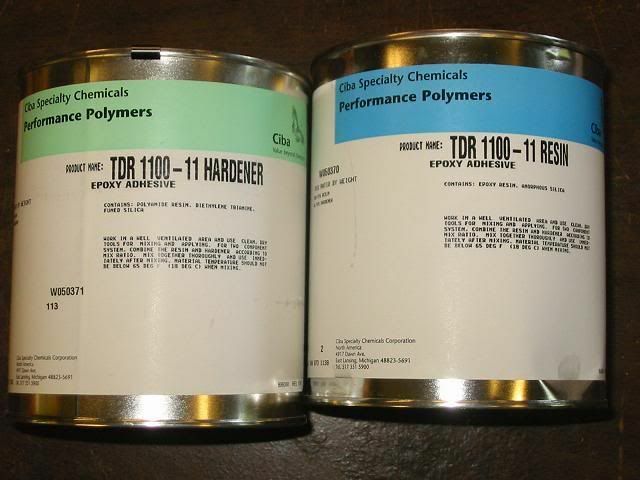 This is a two part epoxy that gets stronger if cured under a heated condition. 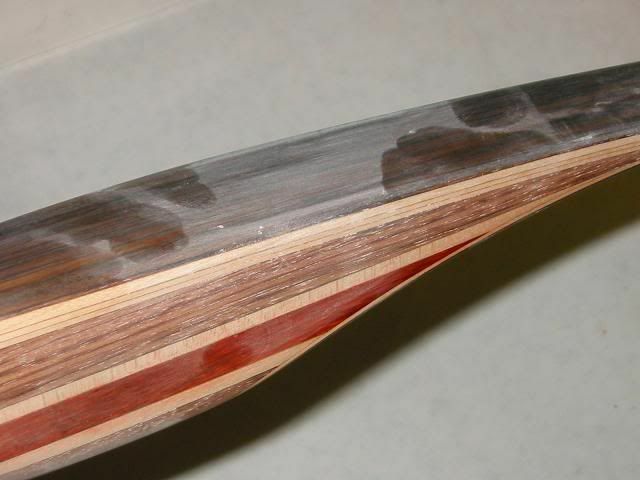 This is important because if you leave the bow in a hot car on a sunny day, The glue had better have been cured at a high temp to keep the bow from de-laminating. 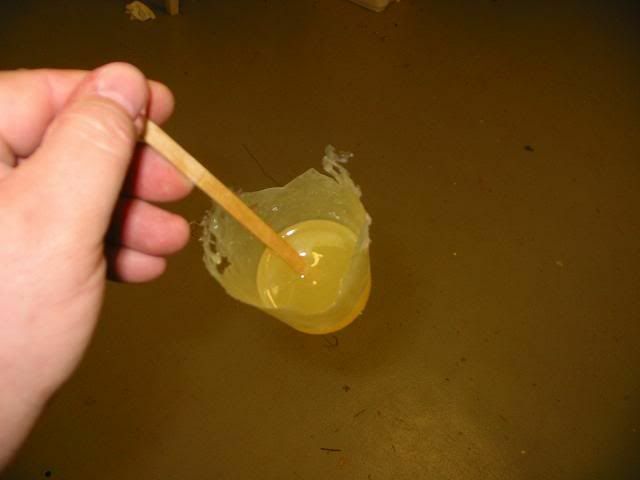 It mixes like any other epoxy. 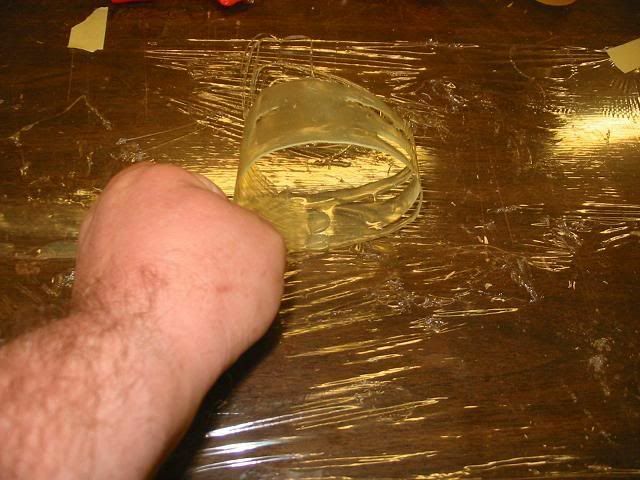 Make sure to cover your work surfaces with wax paper or plastic wrap. It is hard to clean up any spills. Then simply butter both sides of the surfaces to make sure you have no dry spots that will later separate. 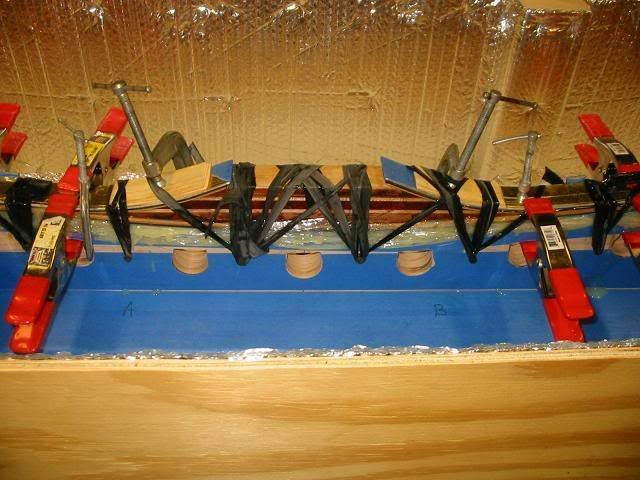 I use spring clamps because C-clams will get loose during the heating process when the glue oozes out. 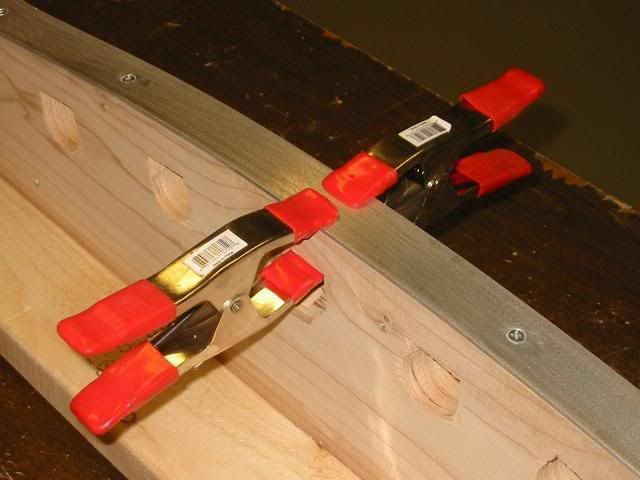 (trust me, there is a lot of oozing) Spring clamps keep a constant pressure at all times. 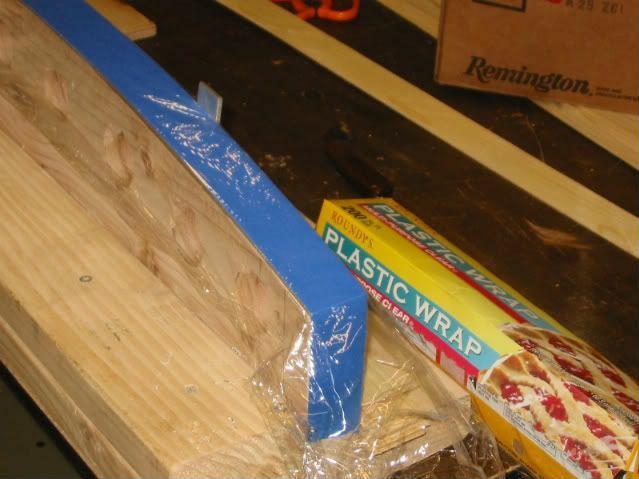 When it comes time to glue up the bow itself, I will build an oven box that is 6 feet long as the bow will not fit in the oven. I will heat this box with 100 watt light bulbs. 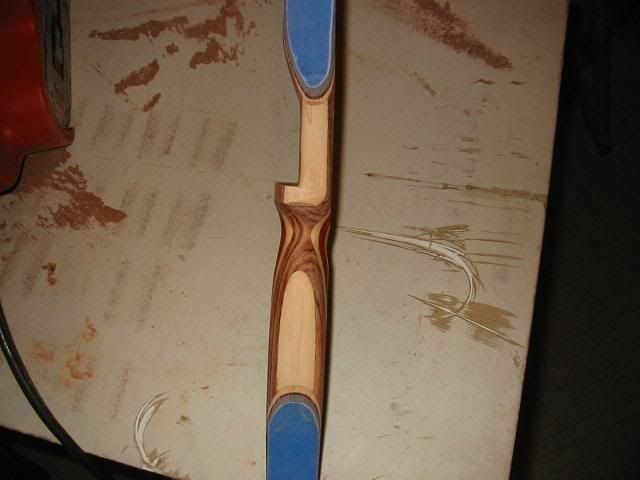 Fast forward 8 hours and a few more hours for a slow cool down period and the riser is all glued up. 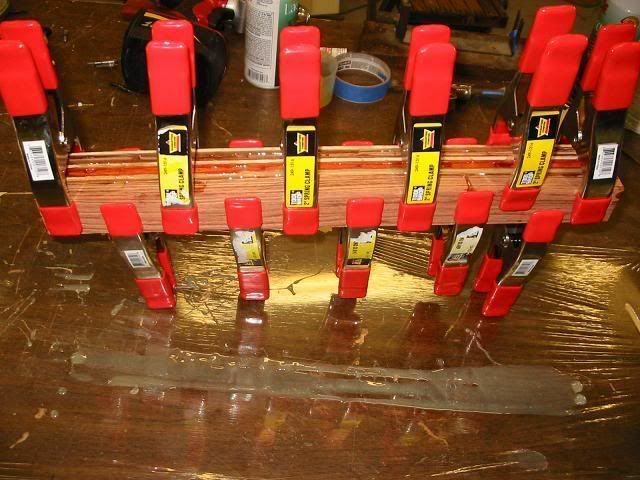 The rubber tips of the clamps need to be pried from the glue. 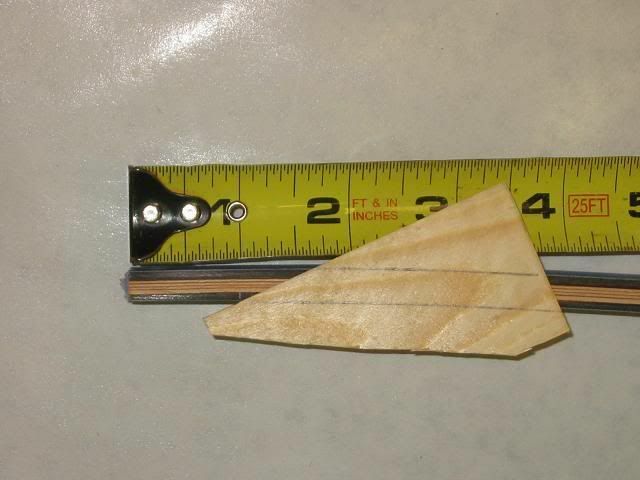 Next, I ran the block through my table saw to square it up and remove the excess glue. 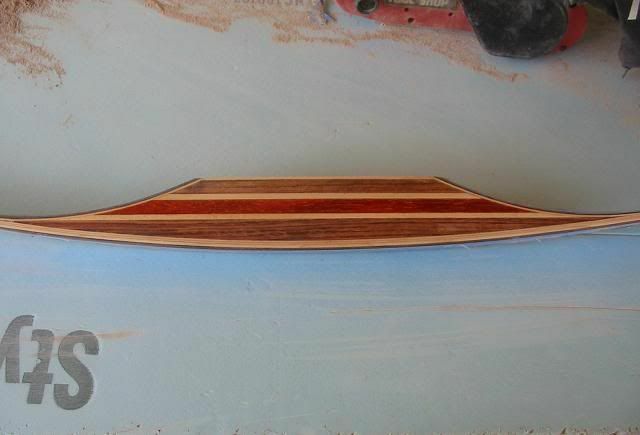 Then I drew the riser pattern on the wood and cut it out with a band saw and sanded the fade outs on a drum sander. 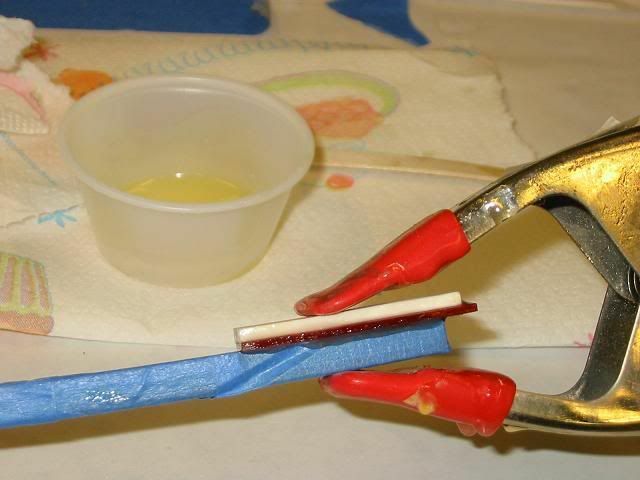 This glue is a flexible epoxy. 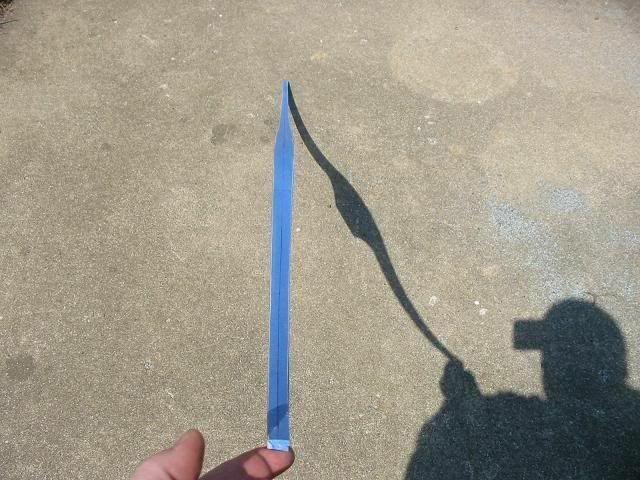 Normal hardware store epoxy would crack and break if bent like this. 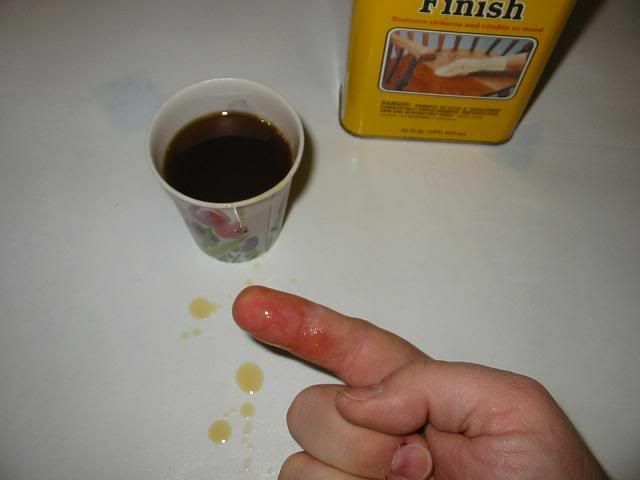 Make sure to use only enough glue for the job at hand. A little goes a long way. 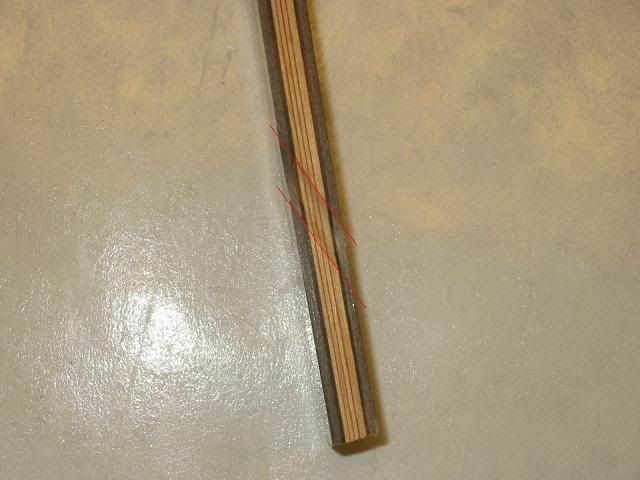 I now need to make the form that I will use to glue the bow on and I need to make the heat box. 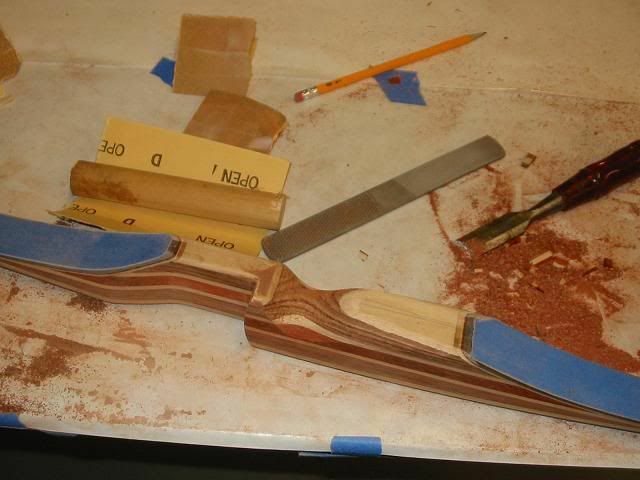 Before I can go any farther with Josh's bow, I need to build the form that the bow will be glued together on. There are a lot of ways to go about this and forms can be made many ways but I chose a way that seemed easy to me. 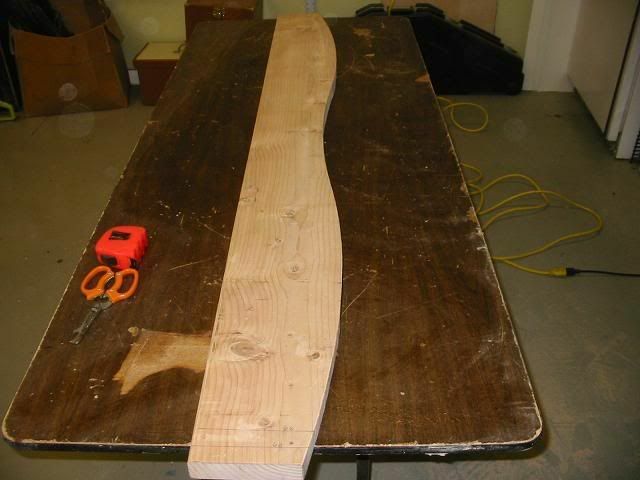 I bought a nice straight 2 x 10 and traced the form that I came up with onto the wood. 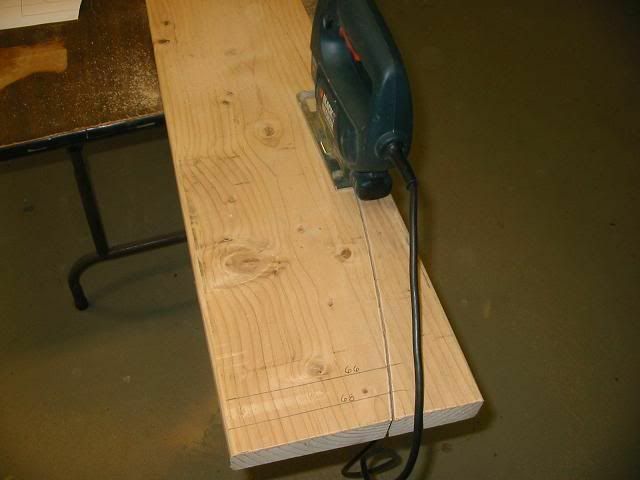 Then cut it out with a jig saw. 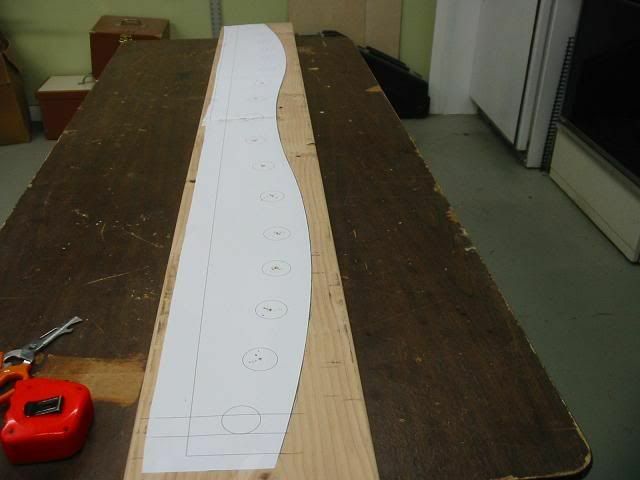 I then went over the entire length of the curve with a square to make sure there were no twists in the form. 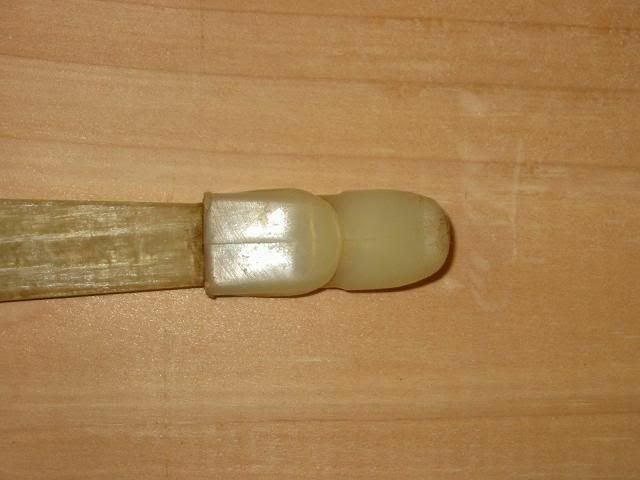 Any irregularities were taken out by sanding. 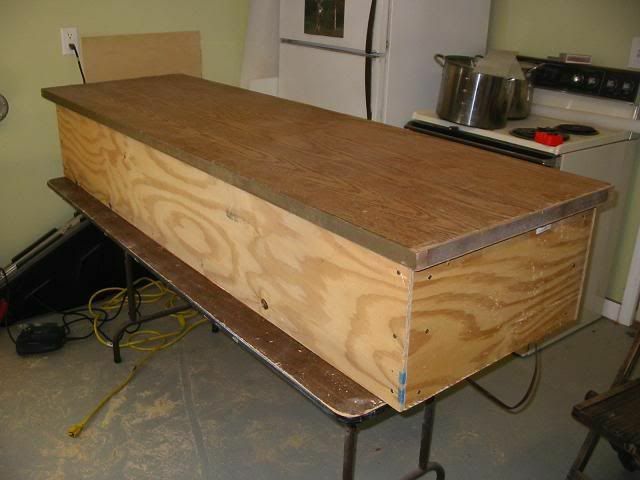 In order to keep the form straight over time and in the heat of the oven box, I screwed a few 2x4's along both sides. They will also act as feet to keep the form from tipping over. 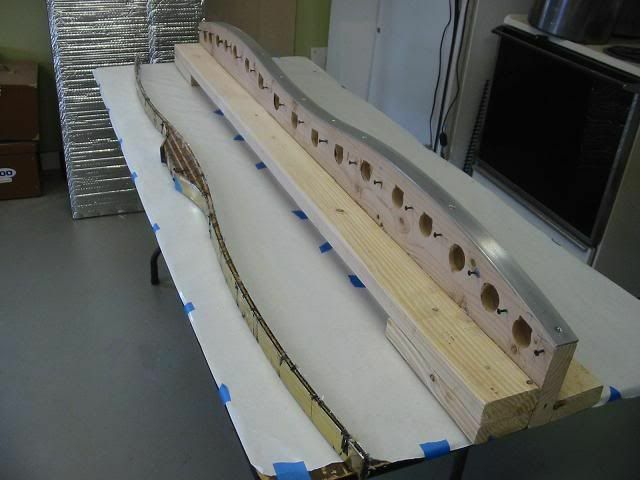 Next, I covered the entire curve with a piece of 1/8th inch thick by 1 1/2 wide aluminum strip. 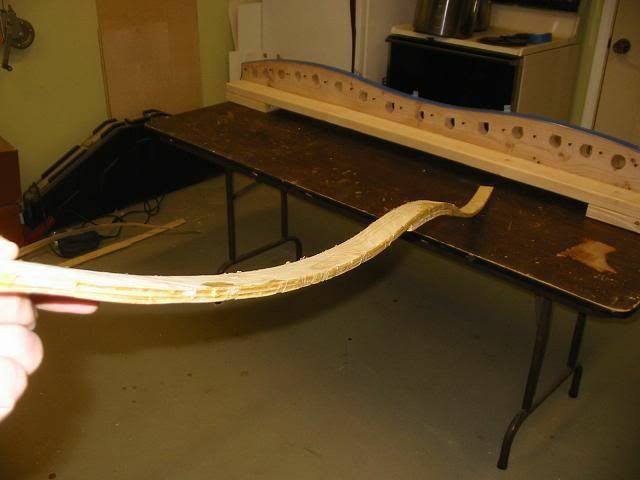 This will make the the curve a much better surface to build the laminations on and it will be more repeatable should I want to build more bows from this form. 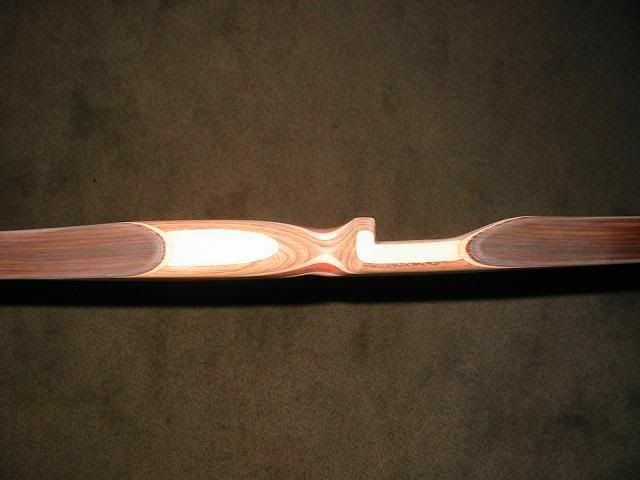 This form will build bows up to 70 inches in length. 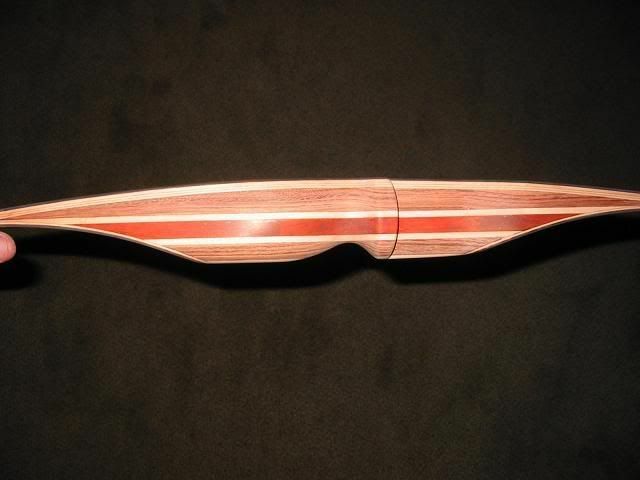 This bow will be a 66 inch model. I need to drill a bunch of clamp holes along the curve for the spring clamps. 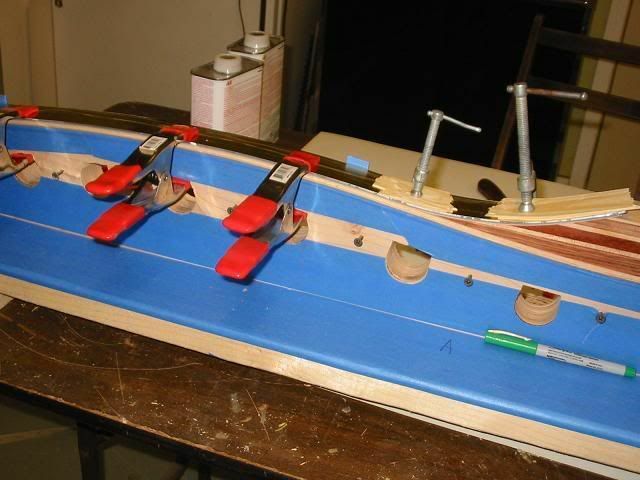 When I assemble the bow, I plan to use spring clamps to compress all the layers of wood, fiberglass and epoxy together. 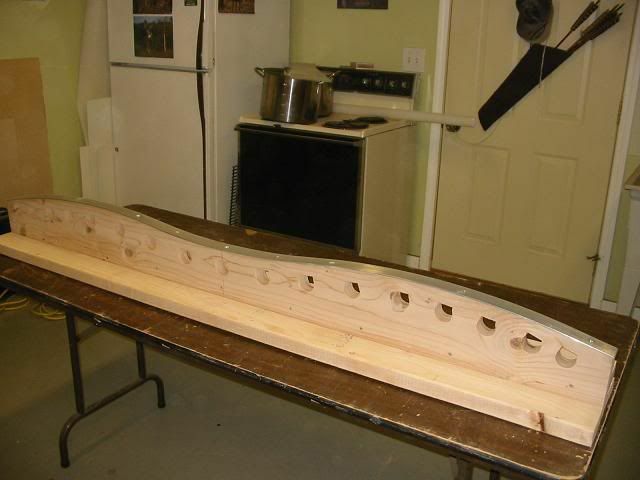 I drilled big round holes and then used a jig saw to square up the side of the hole closest to the top surface. 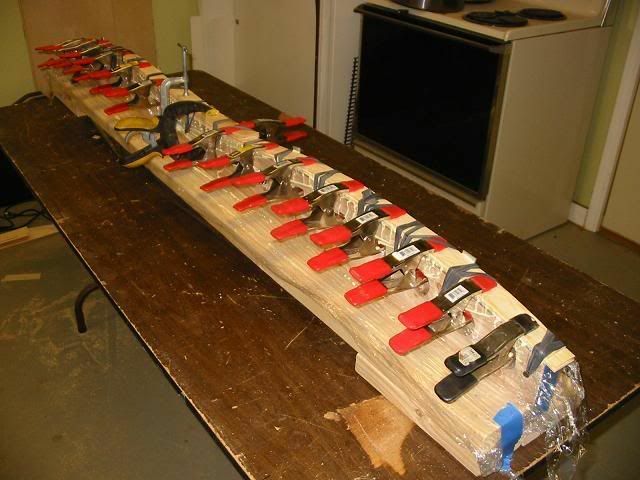 This will give the clamps a little more room. 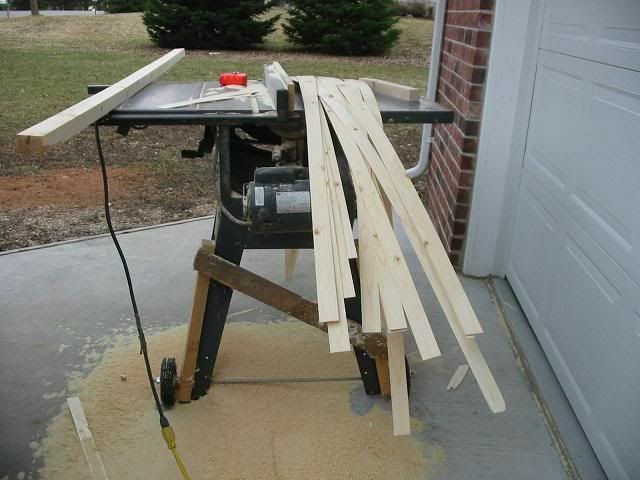 I will use one clamp on each side of the limb. Like this. I also got a package in the mail today from Old Master Crafter of Waukegan, IL. I ordered the wood laminations a few days ago and these things showed up a lot faster than I was told they would. 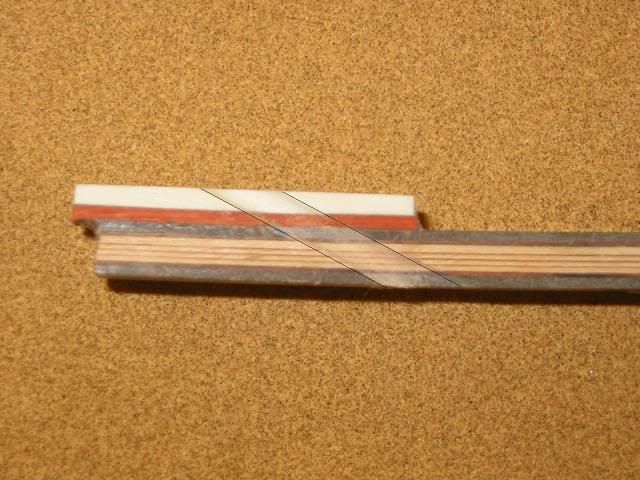 (Great Service) It does not look like much for about $60 but what it is, is 6 taper ground action wood strips that are .065" thin on one end that taper at .001" per inch of length. 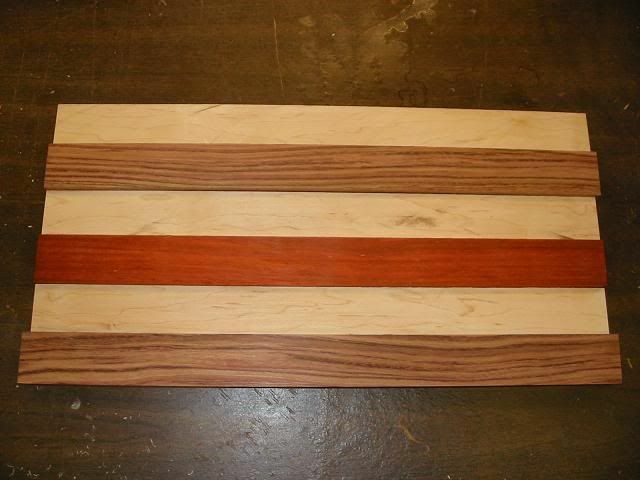 The strips are 36 inches long and 1 1/2 inches wide. 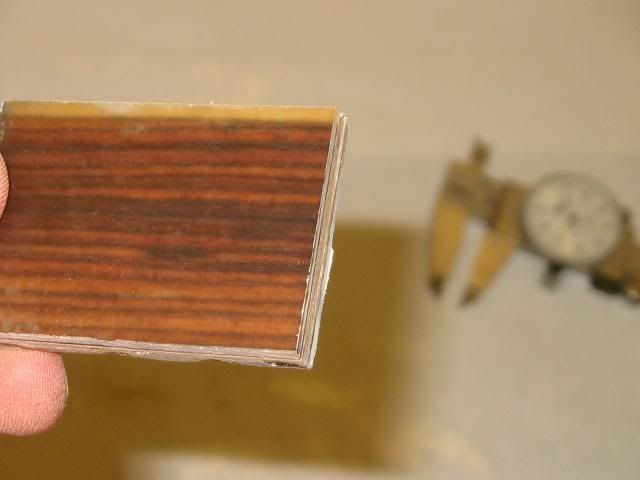 they came protected by two nice looking strips of Zebra wood. I will use them for knife handles at a later date. 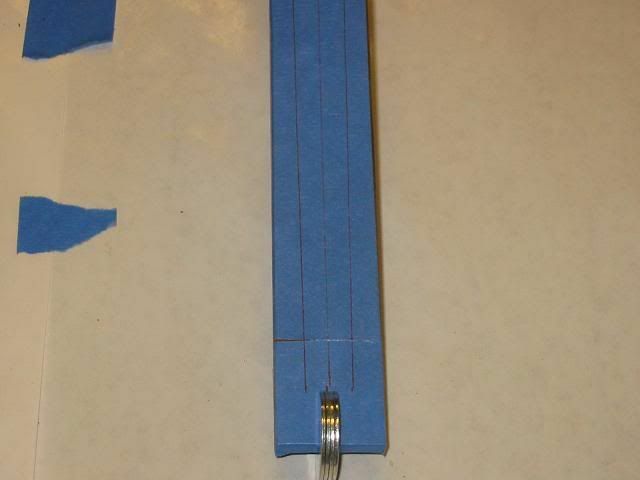 I placed the thick end of one piece next to the thin end of another so you can see the taper. Each limb will get three of these tapers and one strip of parallel thickness Hard rock Maple that is from the piece of wood my Father cut so many years ago. 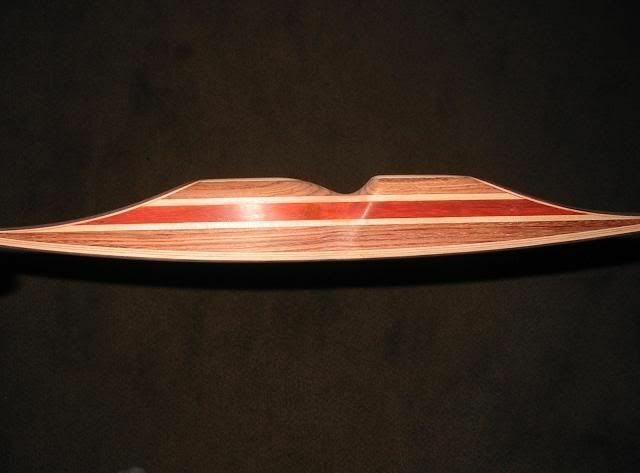 This is the same piece of wood that I used in the riser. 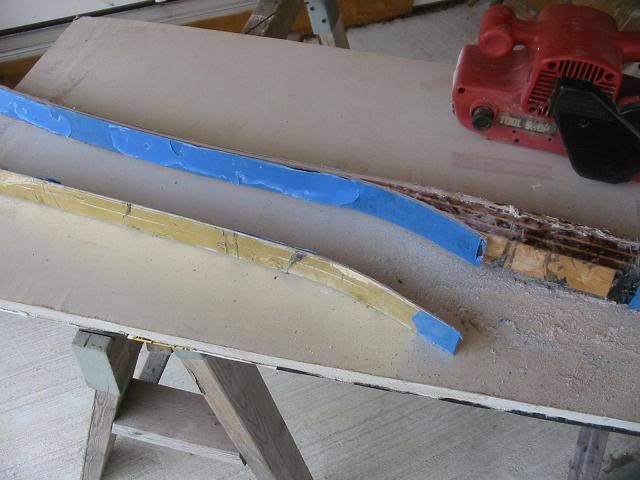 On the front and back of each limb will be a thin layer of Kingwood and then clear fiberglass. 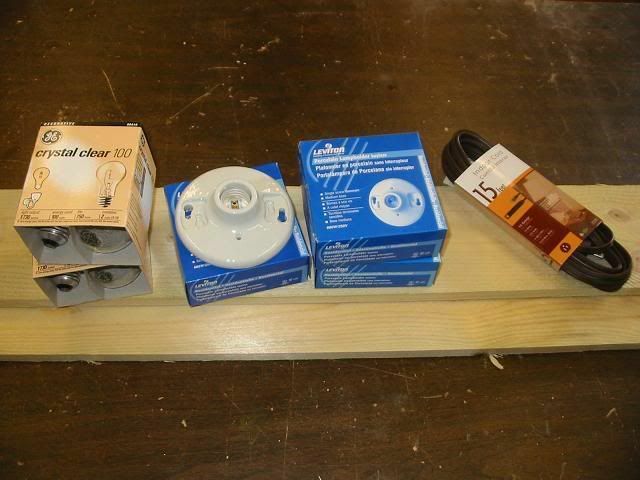 All of this will be assembled with the same epoxy I used to make the riser but first I need to assemble an oven box. I built the oven box for the bow form. I will spare you the details since it's just a wooden box made from scrap plywood that was left over from another project. I will say that It is 12 inches high and 22 inches wide and 74 inches long. By removing 6 screws at each end of the box, I can reduce the box to four individual panels for easy storage. The box has neither a top or bottom. 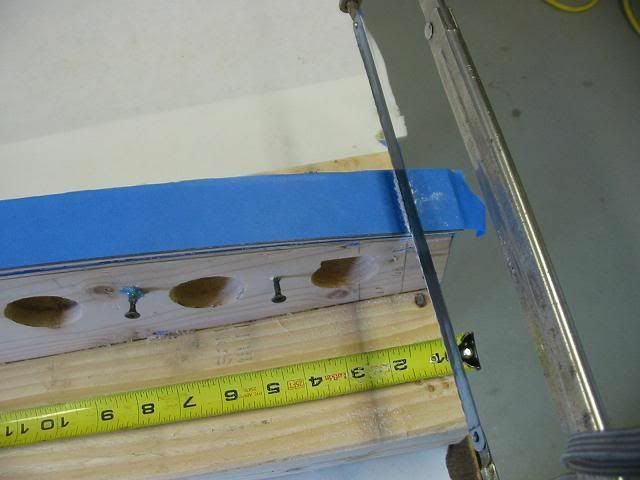 The reason for not having a bottom is so that I can bring the box to the form that will be covered in oozing epoxy and many clamps (creating a challenge to move) I would rather bring the box to the form. 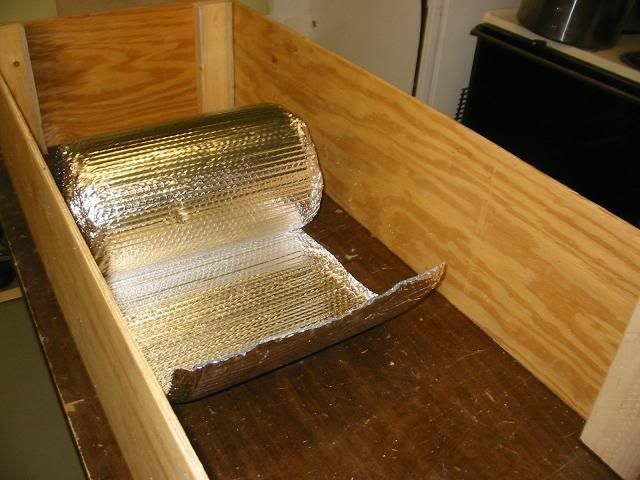 With the box complete, I assembled the heat source that I will use to raise the inside temp of the box to 160F. A trip to the Home Depot for the supplies ran me about $30. The first step was to get rid of those pesky warning labels. Nobody reads them any way. The extension cord company knows I am not going to read the label in English so why would they expect me to read it in Spanish? 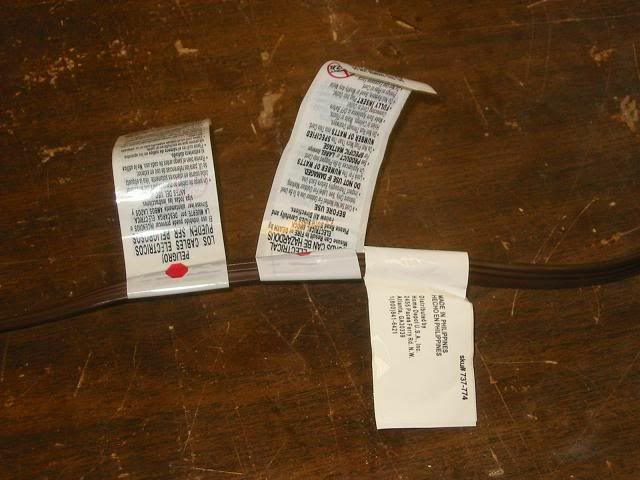 I hope the extension cord labels are not like mattress labels. I would have to spend time behind bars for removing them. 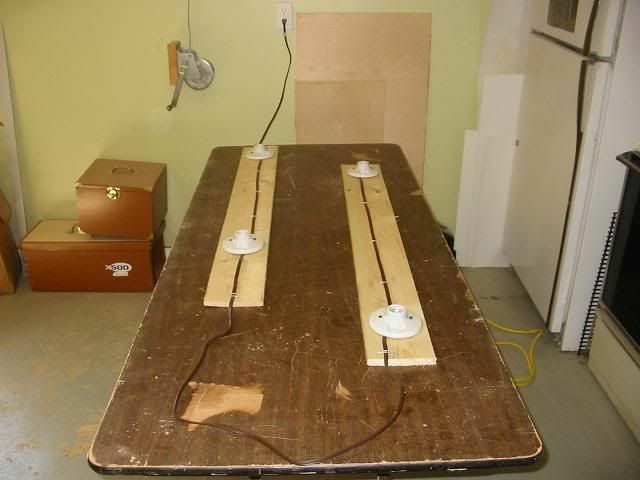 Once I cut the extension cord into bits, I wired the light bulb bases together in series so that one plug would power them all. A quick test revealed that I had had paid attention in shop class. 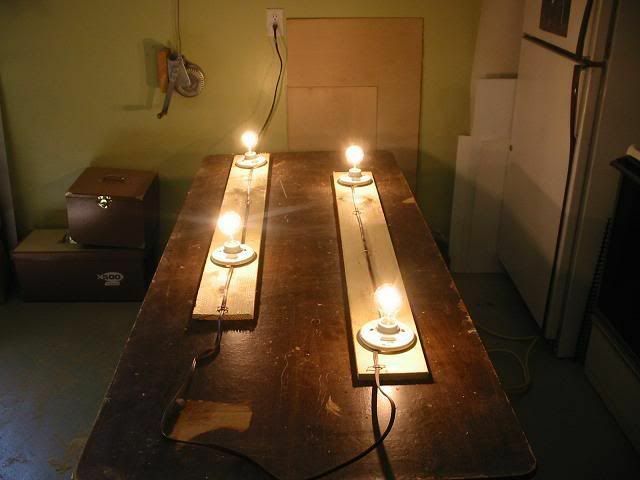 I placed the form between the two light bulb boards and brought the box to the form. My Son will need to help with this part as the box is a bit long to handle alone. Everything fits nicely. The cover of the box will be an old closet door from our last house. It is hollow so it is light enough to move around and it was free. 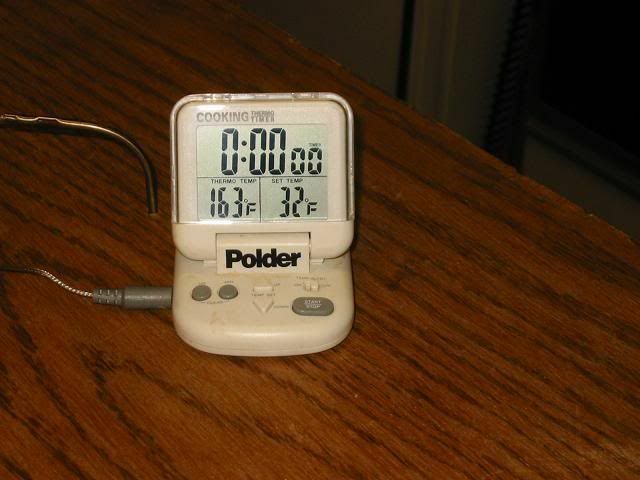 I drilled a hole in the door and inserted the probe of a thermometer. 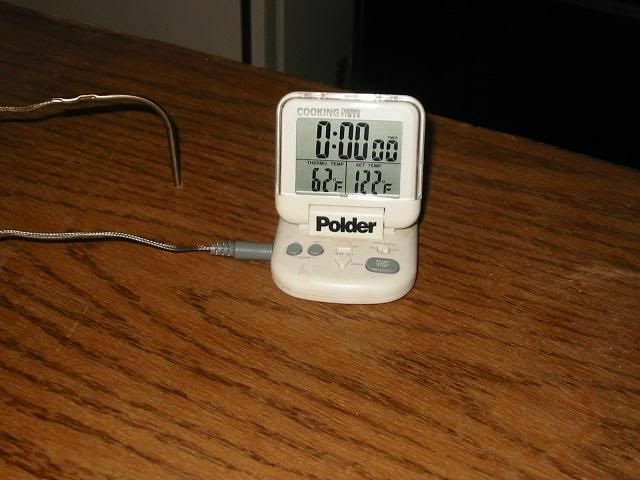 This way, I can keep tabs on the temp inside the box without opening it and letting the heat escape. My wife won't be cooking a turkey for a few months anyway. 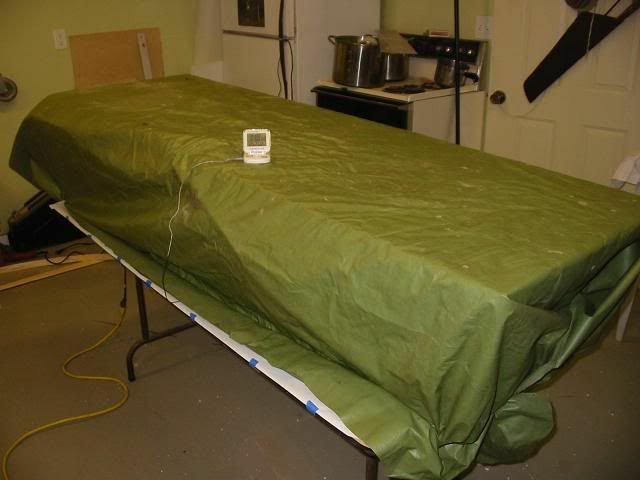 The next test will include covering the oven box with a canvas to trap the heat better. I think 2 extra bulbs should do the trick. 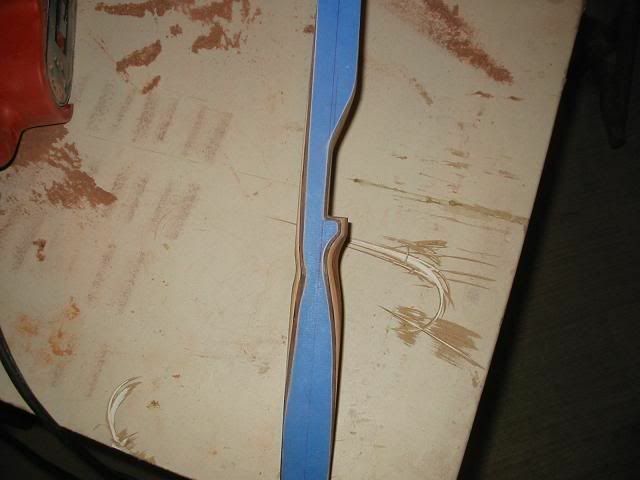 The next step will be to make a test bow out of scrap material so I get the feel for the assembly process and so that I can check the glued up trial piece for any warps that I will be able to correct before wrecking a bunch of expensive woods and fiberglass. It is a piece of mind exercise. 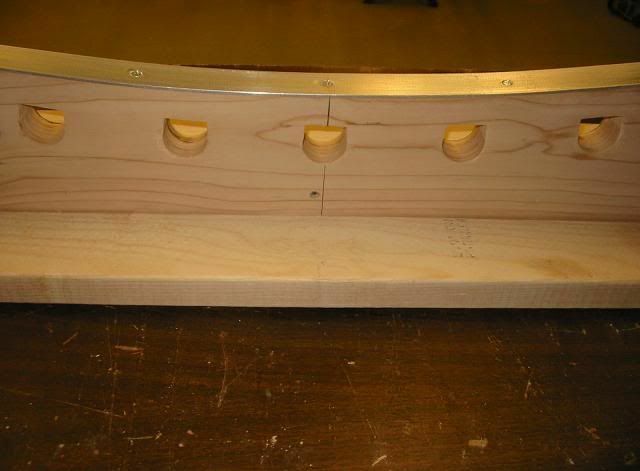 In order to evaluate the bow form, I built a mock up. 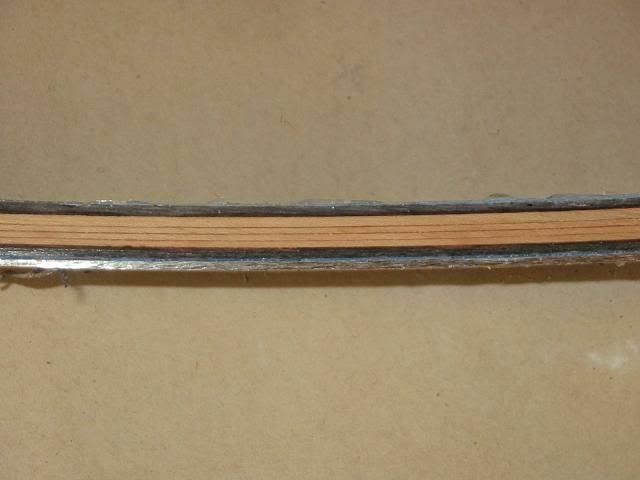 I bought a pine, 2 x 6 and cut it into strips that were .065 thick. 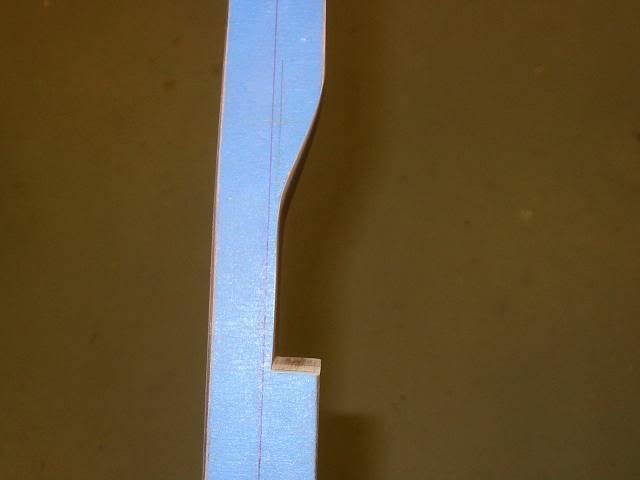 Before gluing the strips together, I protected the form with two layers of tape. 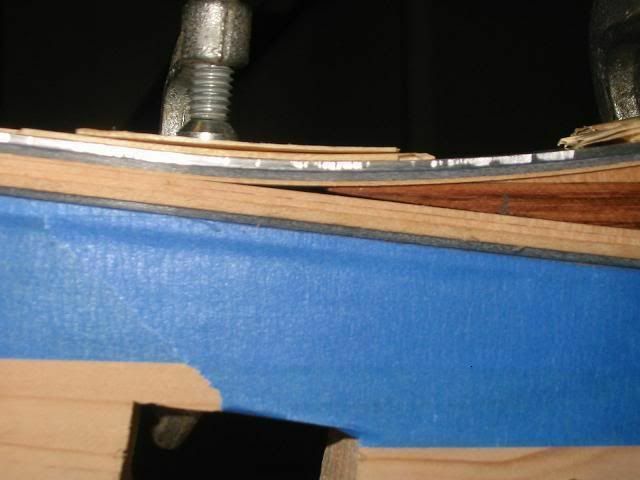 It will be easier to remove and replace the tape then it will be to try and chip away any excess glue from the form. 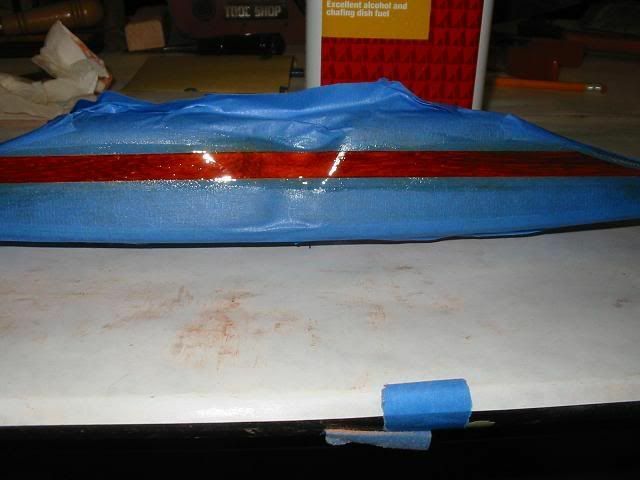 Next, I covered the surfaces of the form with plastic wrap to keep it clean. I used yellow wood glue for the mock up. It did not require the oven box. 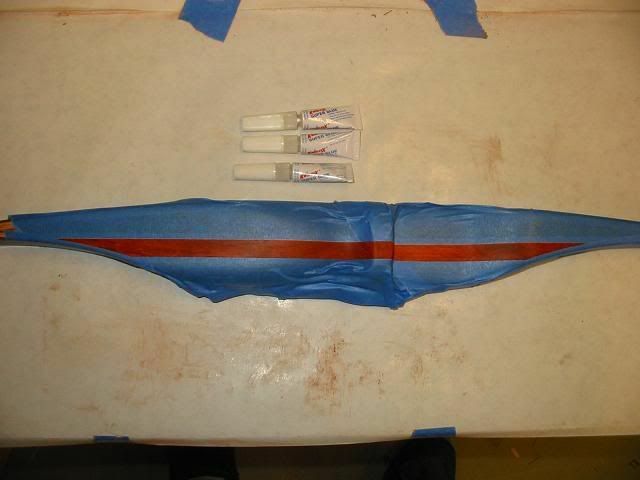 Once all the layers were covered in glue, I used clamps and strips of rubber inner tube to compress the layers. In the center section (where the riser will be) I added a few extra strips. 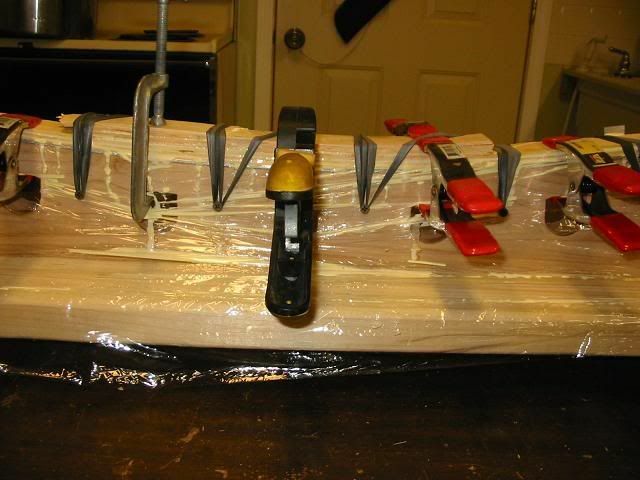 After 24 hours, I removed the clamps and the plastic wrap. There was no "Spring back" or relaxing of the wood strips. I then took the mock up and reversed it on the form to see if it was symmetrical and it fit the form equally in either orientation. I checked for twists in the limbs and found none. This allowed me to nest the limbs and look for any twists or differences between the two. Everything looked good. I think all is ready to assemble Josh's bow. I will want to baby sit the oven box for the 8 hours that it will cook. I insulated the inside of the oven box to help with heat management. I bought a roll of insulation that is made from a double layer of bubble wrap with heavy duty foil on both faces. It is just under a 1/4 inch thick and lightweight. I used a staple gun to attach it to the inside walls of the box and to the under side of the box cover. 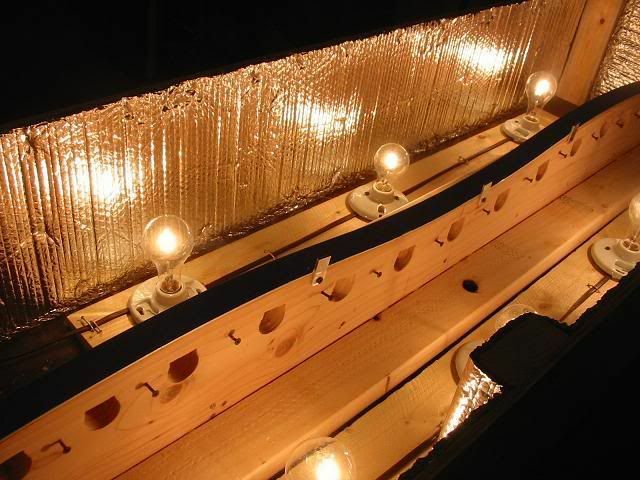 I then added two additional light bulb bases to the boards that I had made up earlier. 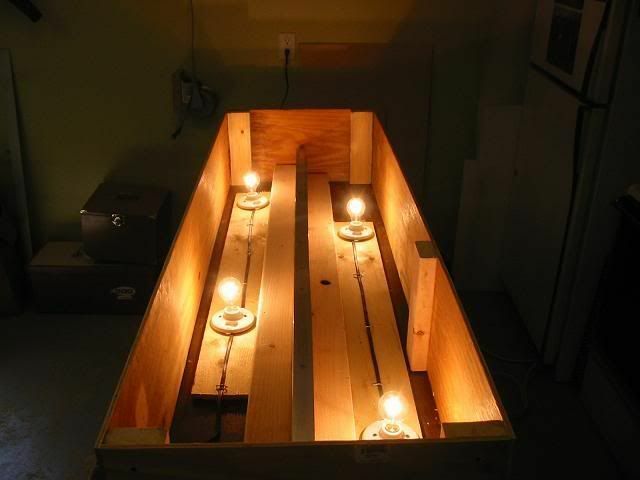 I used 100 watt bulbs in the center two bases so now I have (4) 150 watt bulbs and (2) 100 watt bulbs. 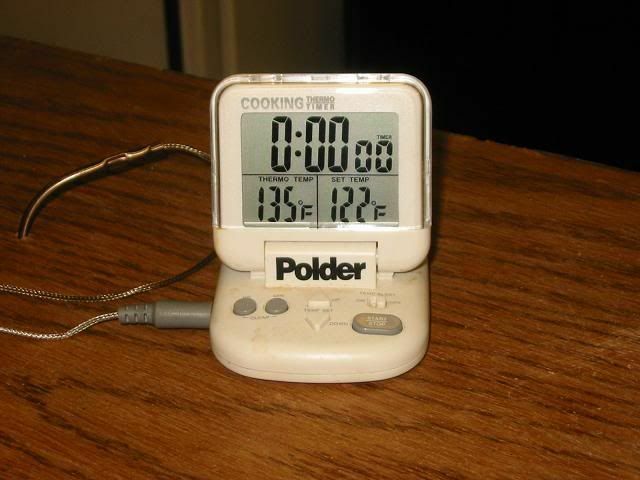 After one hours, the temp had risen to my goal temp of 160F. I felt the outside of the box in several locations and could not feel any heat escaping through the walls or lid. After 2 hours, the temp had risen above my goal but I consider this a good thing since I will now be able to crack the lid a bit or perhaps unscrew one bulb to control the temp. The oven box is finished and ready for the big day. 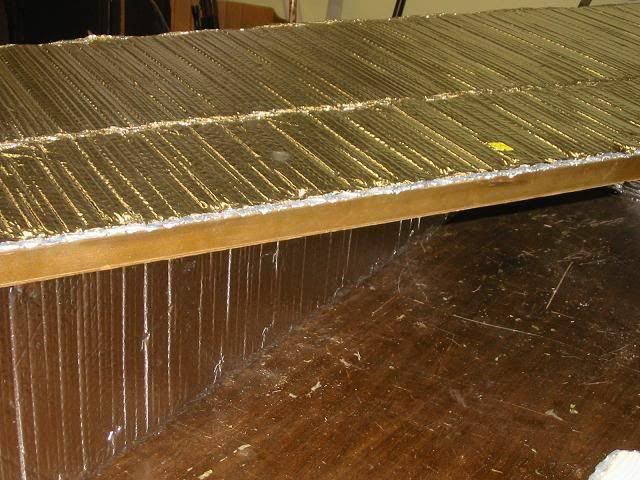 While the riser fits great on the empty form, adding the strip of fiberglass backing, four tapered laminations and the fiberglass face caused the fade-outs to lit poorly. 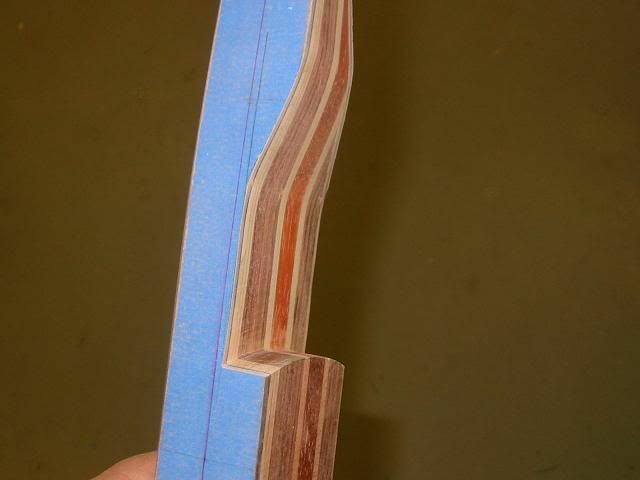 I did not factor in the tapering of the laminations as they work away from the center of the riser. I discovered a gap at the fade-out area. 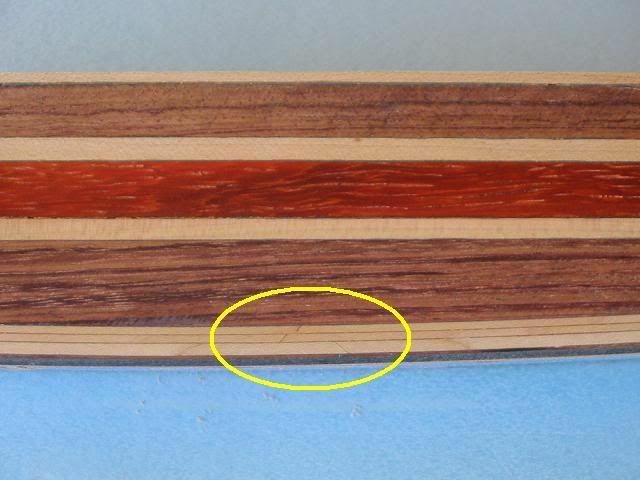 I felt this gap was larger than it should be and do not want a large amount of epoxy at this hinge point. I might just be over cautious but I want a better fit and a consistent glue line. The dark black area near the thinest part of the riser is what I am worried about. I sanded down the riser until it fit better. Time to glue this bow up. I laid out everything I needed since the dry run. 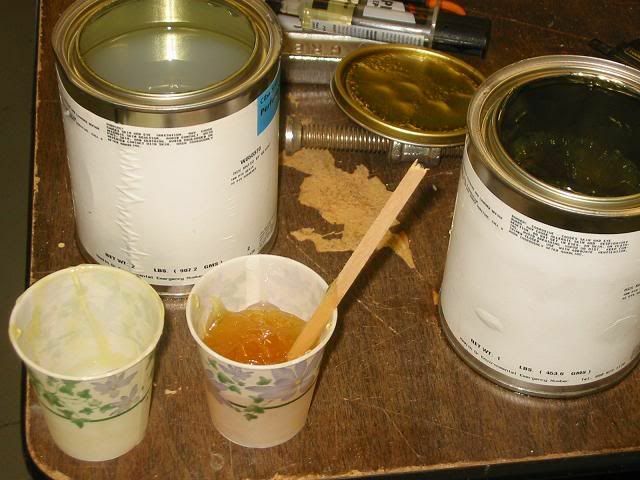 Then I put both quart containers of the epoxy in a basin of hot water to warm them up a bit. 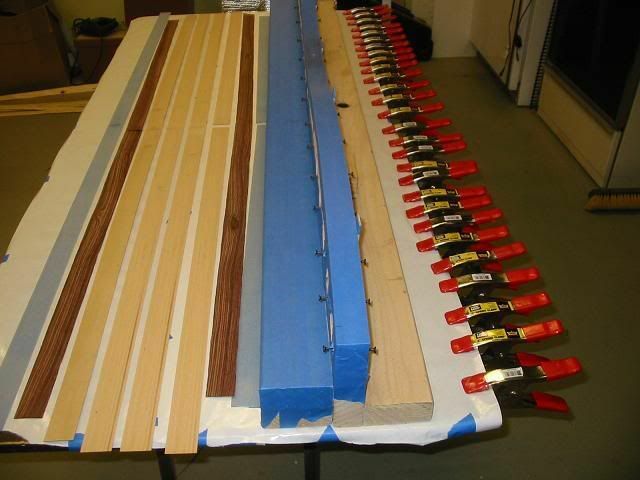 Next, I cleaned all the wood and glass surfaces and laid them in the order in which I would glue them. Missing from the picture is the riser. 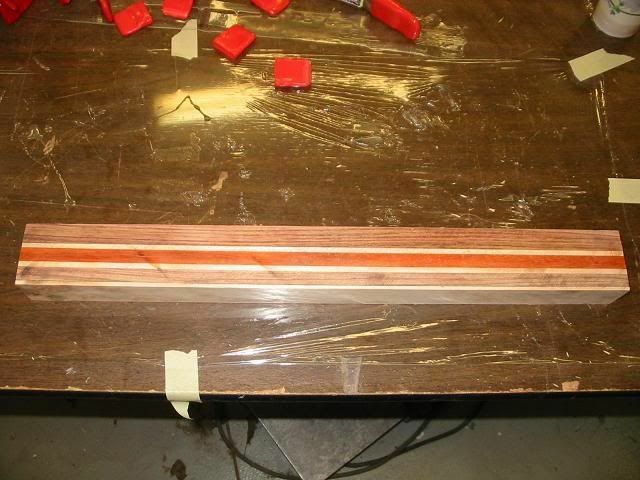 Fast forward to a completed glue up with the warmed epoxy. Due to the mess and the fact that I was working alone, I did not slip out of my sticky rubber gloves to take pictures along the way. What a slippery mess to work with. 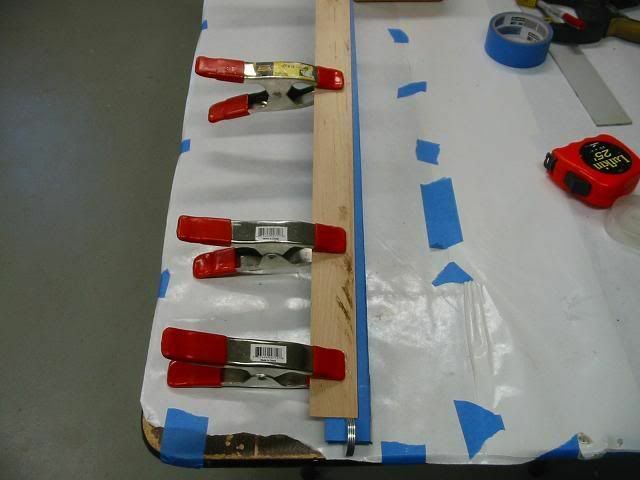 I used a combination of spring clamps and rubber inner tube strips to compress all the layers. I had more C-clamps at the center (on the riser) but I took them off once I realized that they stuck up higher than the sides of the box and the cover would not lay flat. So much for a complete dry run. I should have tried the lid of the box also. Oh well. live and learn. Here is a close up of all the layers and all the extra glue that oozed out. I also learned that I used too much glue. I think I could have built two bows with what came out from between the seams. Once again. Live and learn. Here is the oven box doing it's job of keeping the bow at around 160F. 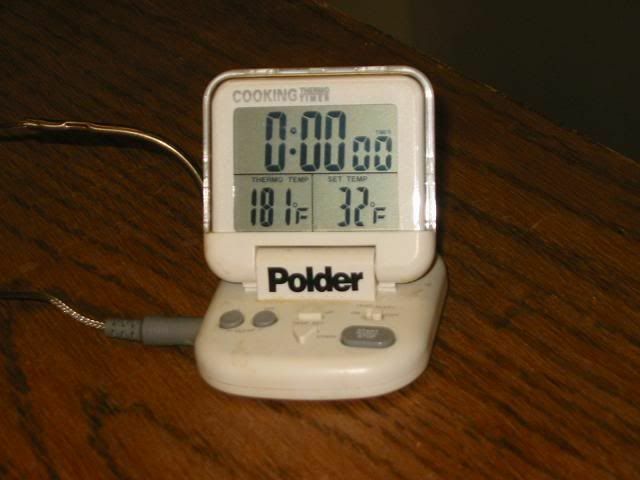 I unplug it before I go to bed and let it slowly cool down over night. It was a day of ups and downs on the bow project. The form cleaned up easy because of all the tape I used to protect it. 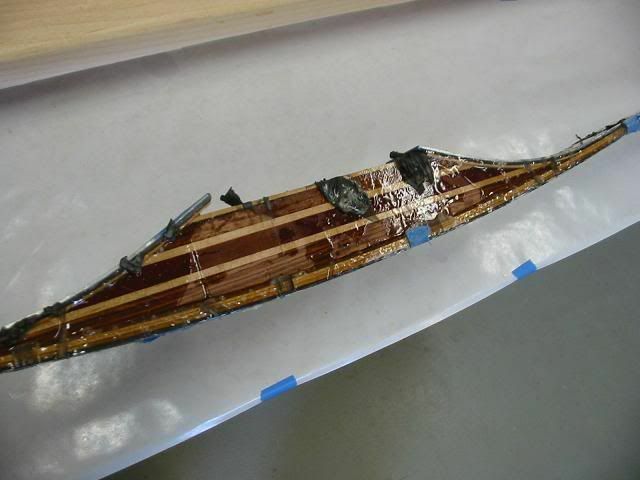 The extra epoxy was everywhere and held bits of the inner tube captive. To save on a mess in the shop (and because it was a nice day) I took the bow out to the back patio behind my shop. The breeze would blow all that nasty fiberglass dust away. 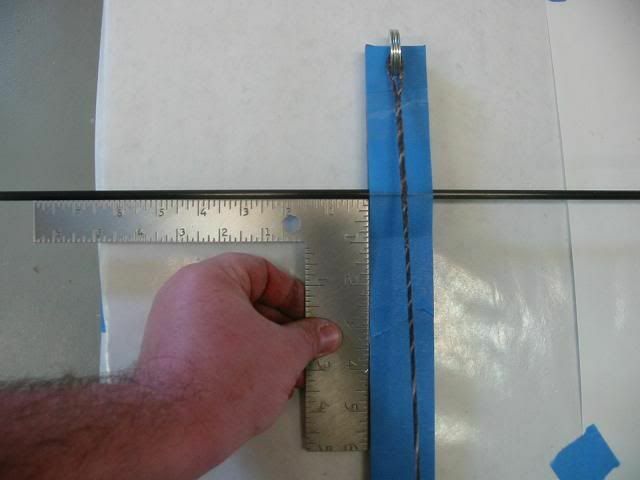 I learned that I need to place a layer of plastic wrap between the last layer of glass and the aluminum pressure strip. 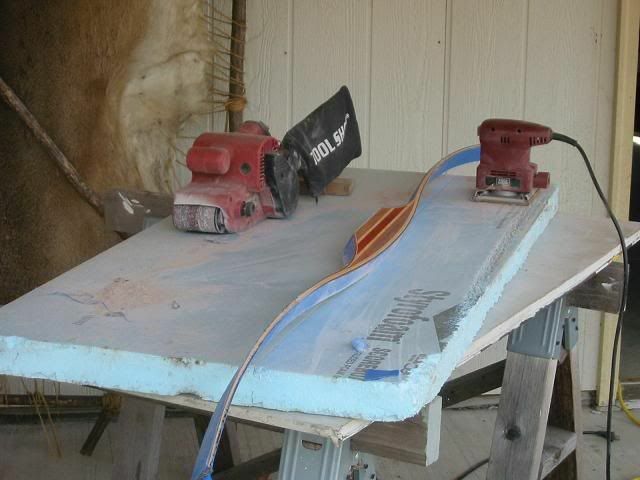 I didn't do that with this bow and needed to sand away the excess epoxy to free it from the bow. 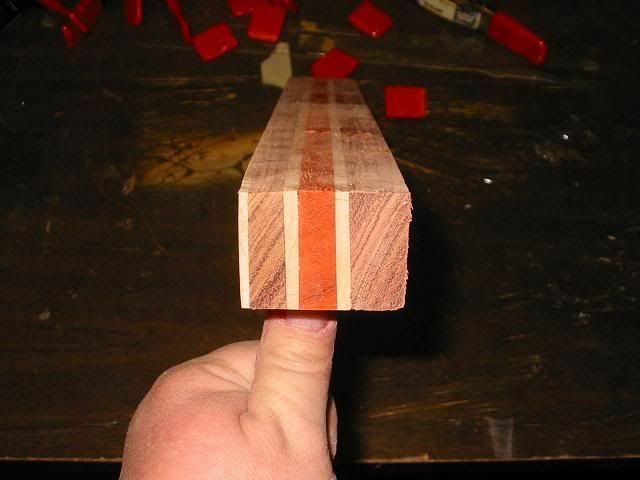 This also gave me my first look at the glue lines between the layers of wood. after sanding both sides I could pry away the aluminum pressure strip. Then I just had to peel away the tape to see how the Kingwood looked under the clear glass. and finally the back of the bow. Everything looked good. Then I worked on the riser. 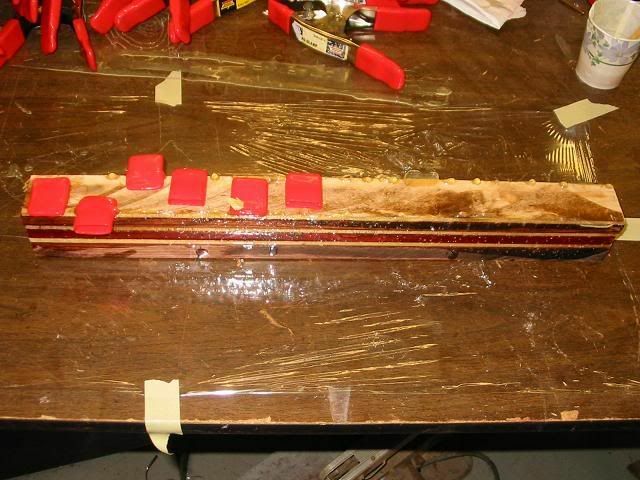 there was a lot of epoxy to remove. 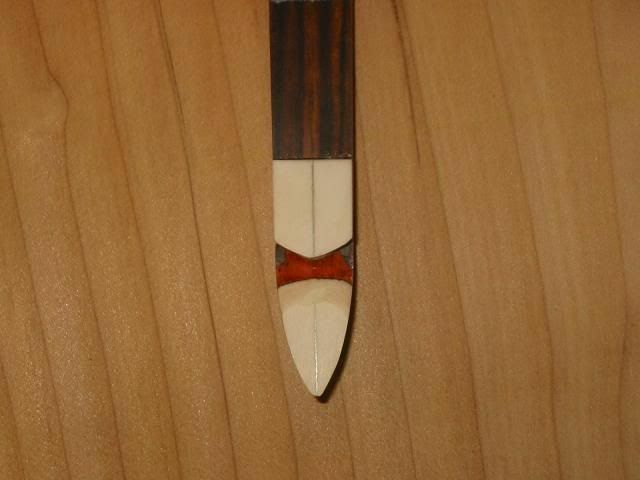 I then made a line on each end of the limbs that was 34 niches from the center point of the bow. 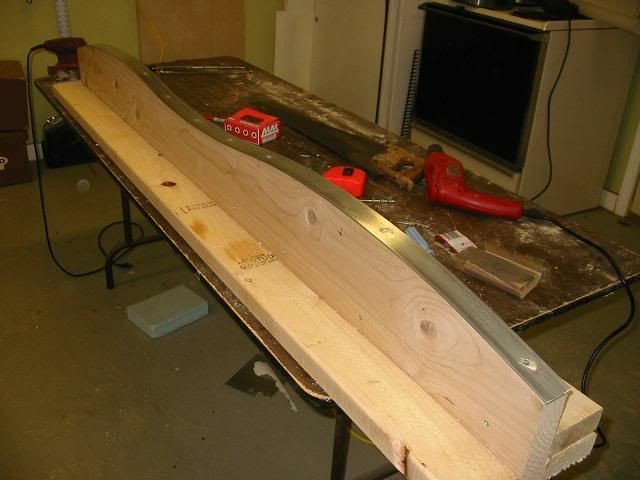 (68 inches overall length) I used a fine tooth hacksaw to cut the ends off. 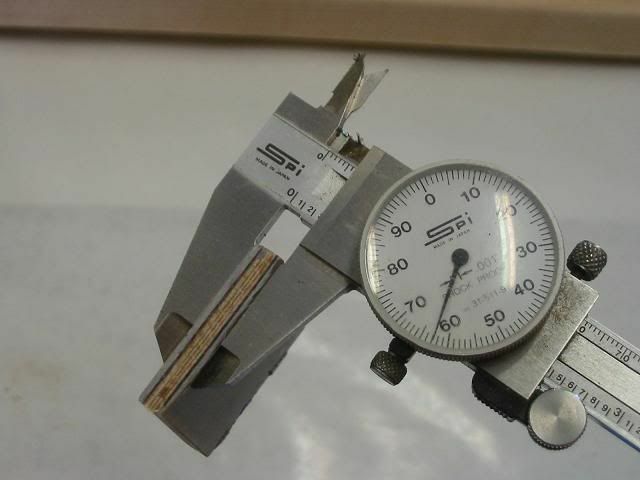 Both ends measured the same thickness. 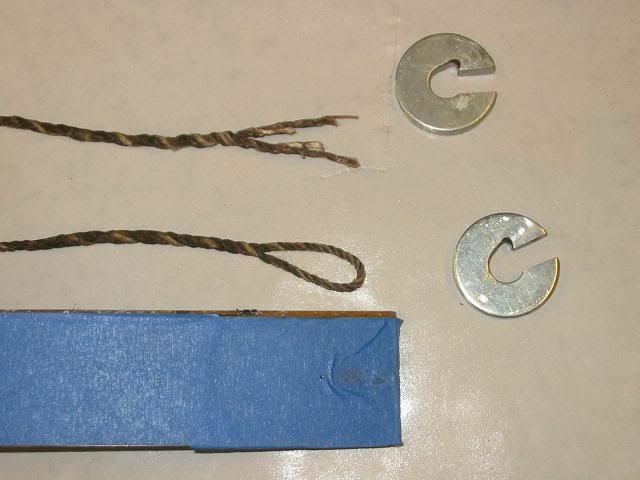 Then I used the washers to string the bow before I cut the string grooves. 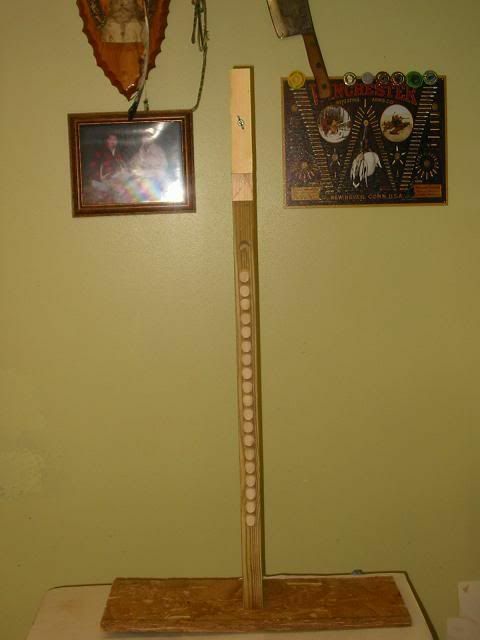 Here is is strung but with a bow string that is too long so the brace height is only about 5 inches. 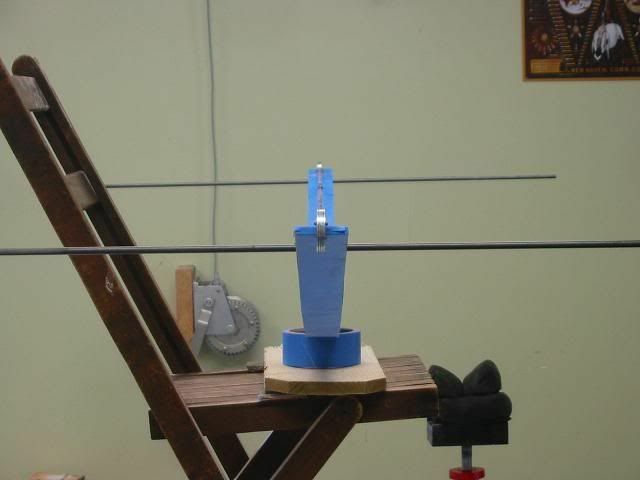 I used the string from my longbow. It is the only string I have for that bow. (that is an important point that will be realized a bit later. 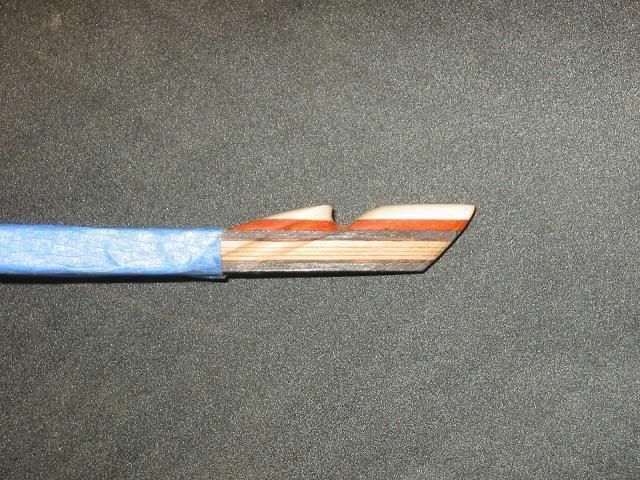 To check for limb twist, I wanted to look at more than just saw cuts at the ends of each limb so I took a carbon fiber shaft and taped it in place on each limb. I made sure they were at 90 degrees to the limb. With the washers in the measured center of the limbs, there looks to be no twist in the limbs. 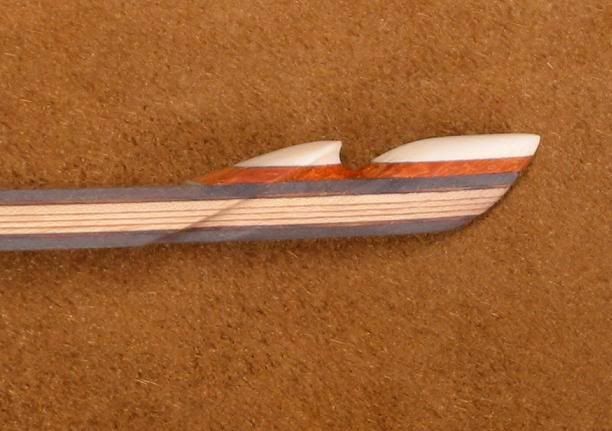 I marked the centerline of the bow along the entire length and used a strip of wood to mark a straight line for the limb taper toward the string nocks. Just as I was marking the last line on the other limb, all hell broke loose, Something whacked me in the finger and the bow jumped up off the table. 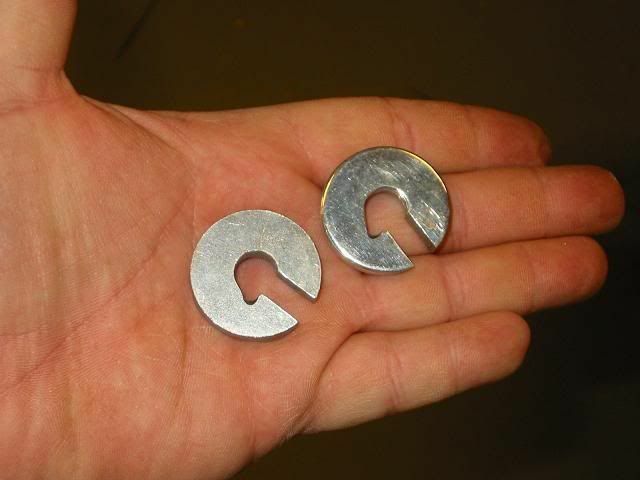 When I figured out what it was, I had to search high and low for both washers. 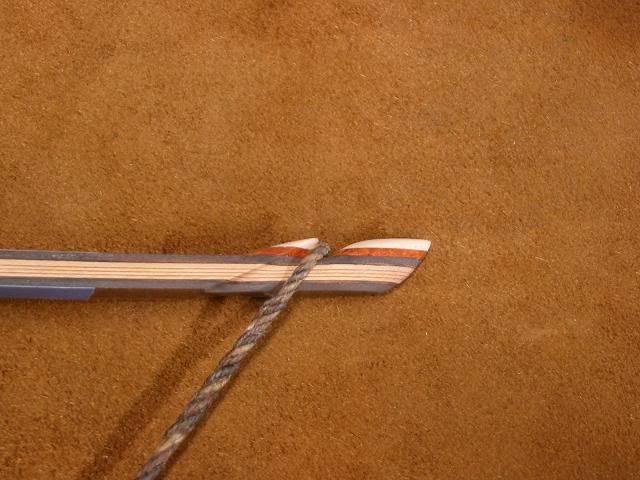 The bow string (my only string for my bow) had broke. 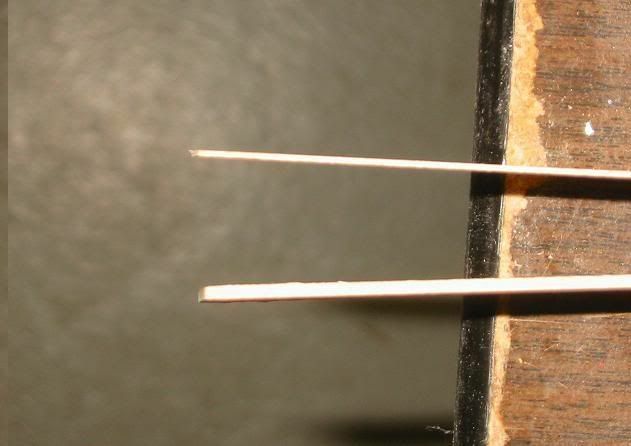 My guess is that I left too sharp an edge on the inside of the groove and it cut through the string. Now I have no string for either bow. Time to scramble and locate a 64 inch string for my bow and a 63 inch string for the new bow. Today was a better day. If there is such a thing as a good time for a string to break, I guess I am lucky. I have a lot of work to do before I need a string again. 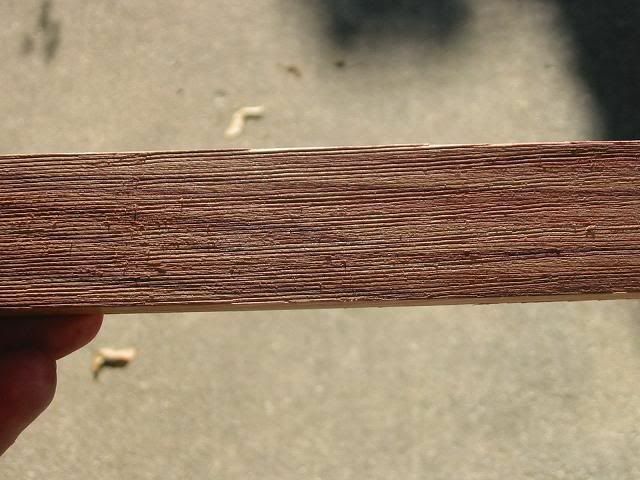 I used my belt sander with a 50 grit belt to grind down the limbs to the lines I scribed. 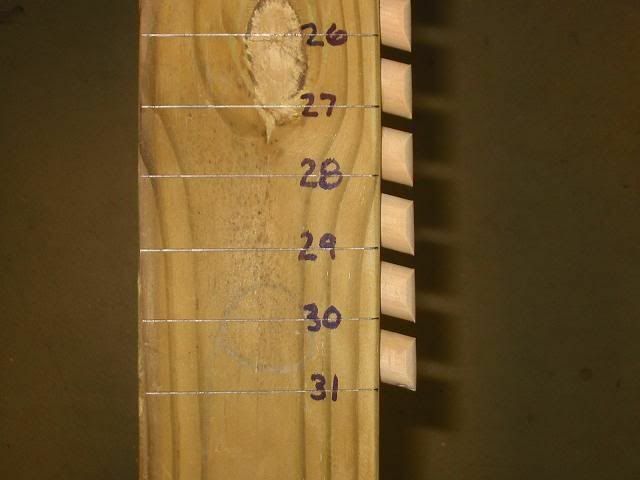 Next, I marked the location of the string grooves in the ends of the limbs. 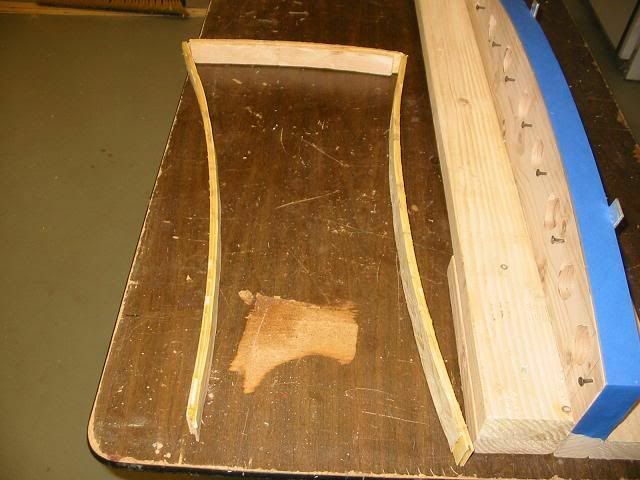 Using a chainsaw file I made the beginnings of the string grooves. This will help me locate the tip overlays. when they are installed, I can finish the grooves. 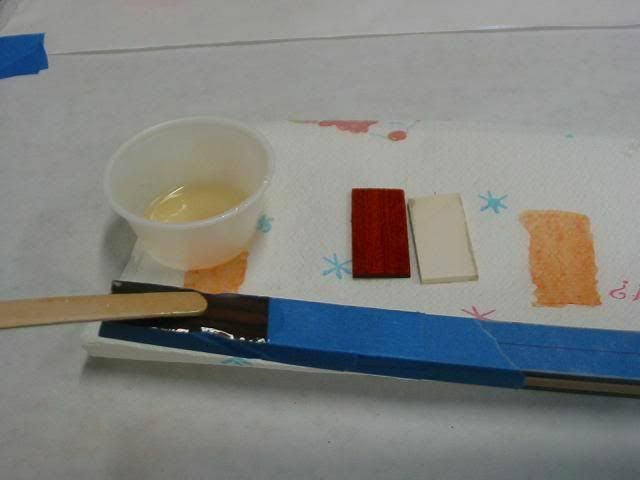 For the overlays, I want to use Bloodwood and antler. 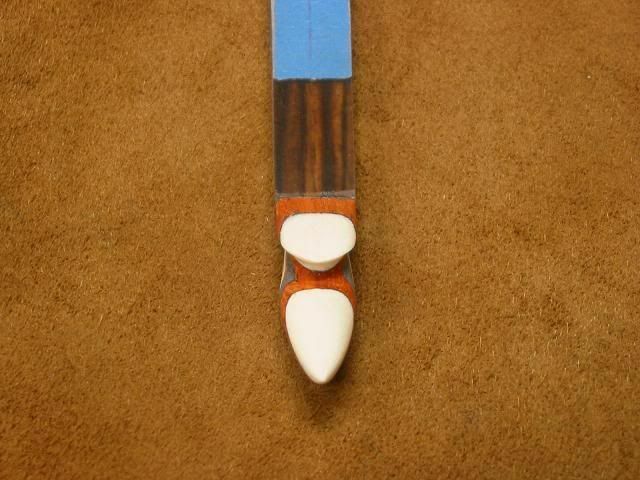 The Bloodwood will match the accent strip in the riser and the antler is just something I wanted to try. 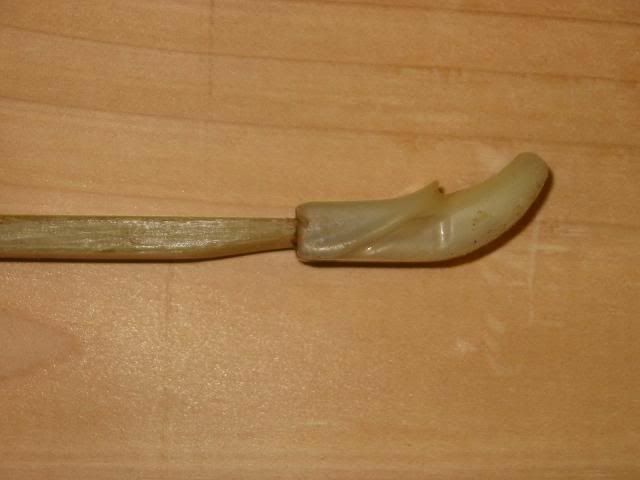 I had a section of antler left over from a knife handle I made. I will use the longest tine as it has no pithy core. It is solid all the way through. 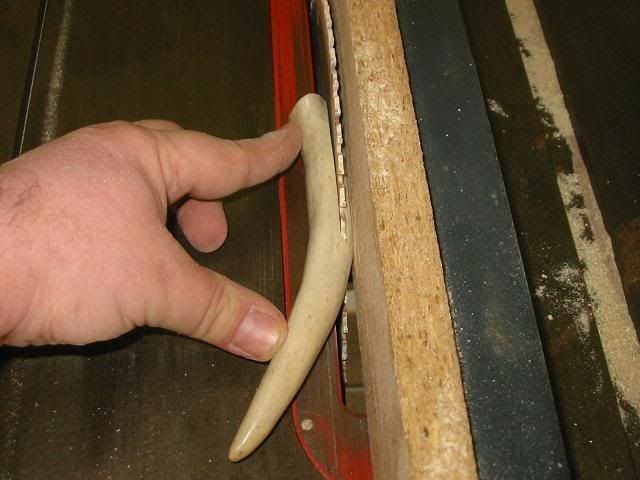 Using the belt sander, I created a flat spot on the antler that will run against the rip fence of my table saw. 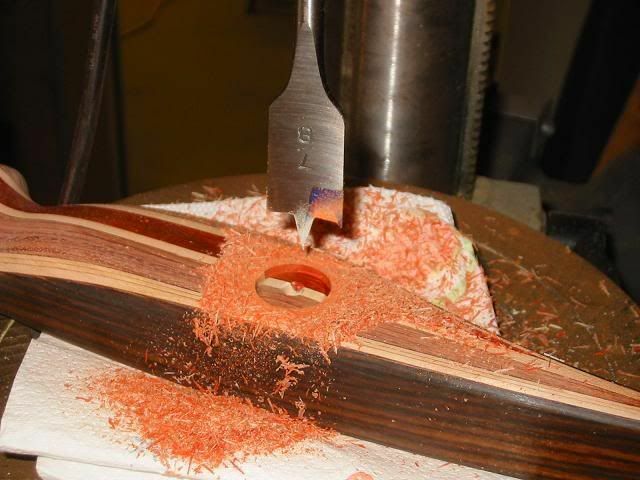 I am using a carbide tipped finish blade so I get less chipping and a smooth cut. 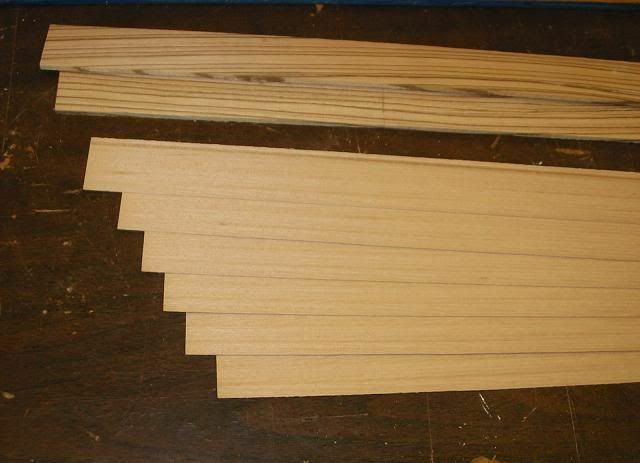 I made the strips about an 1/8th of an inch thick. 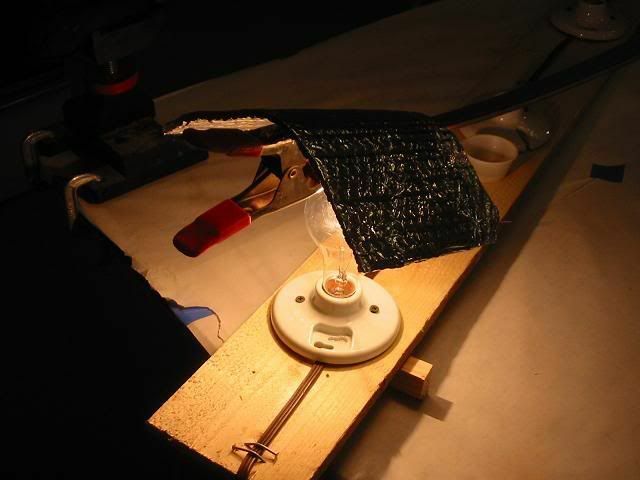 In order to get the best adhesion with the epoxy, I needed to rough up the shiny surface of the clear glass. I used a hacksaw blade as a scraper. 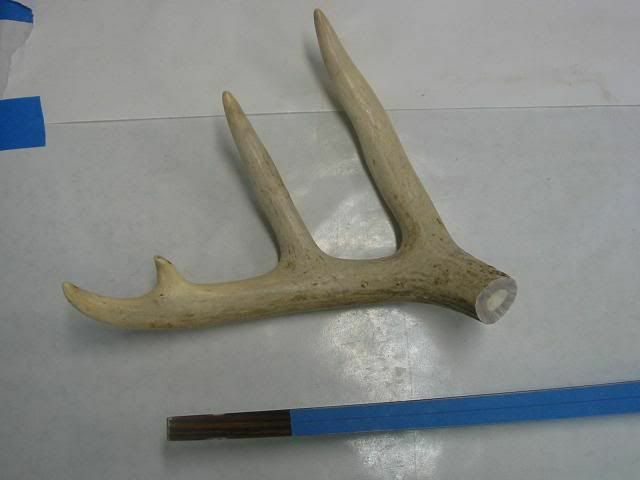 I did the same to the bloodwood and the antler. 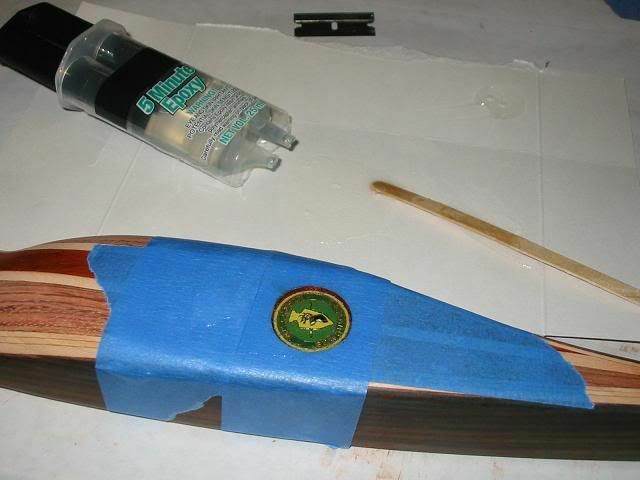 I used the same epoxy, I used for the rest of the bow build. 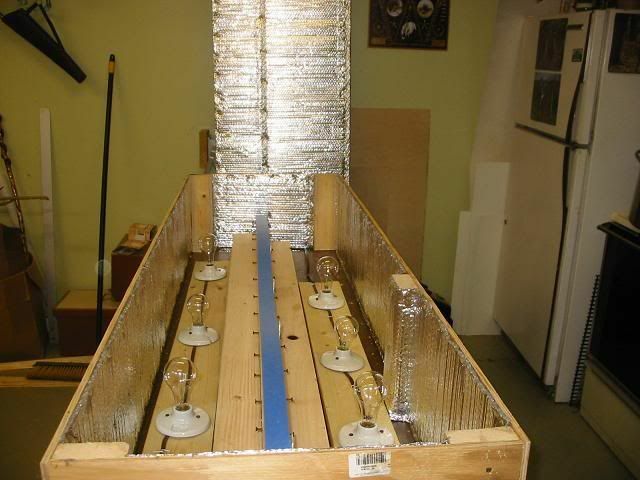 I used only one bulb under each tip and some of the left over insulation from the hot box. Not much I can do except make the tillering tree. 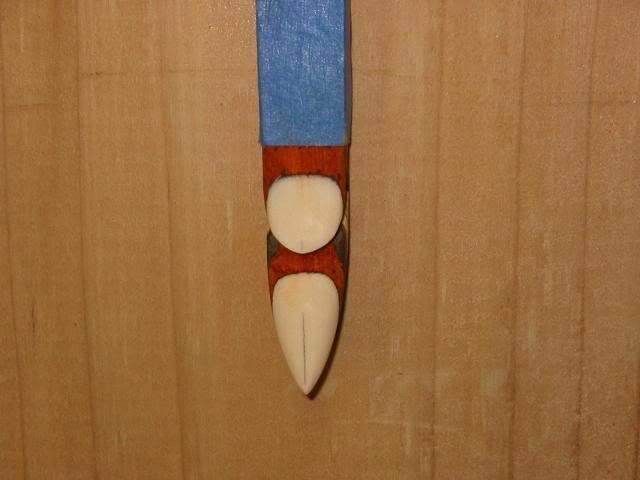 With the antler and Bloodwood overlays glued in place. 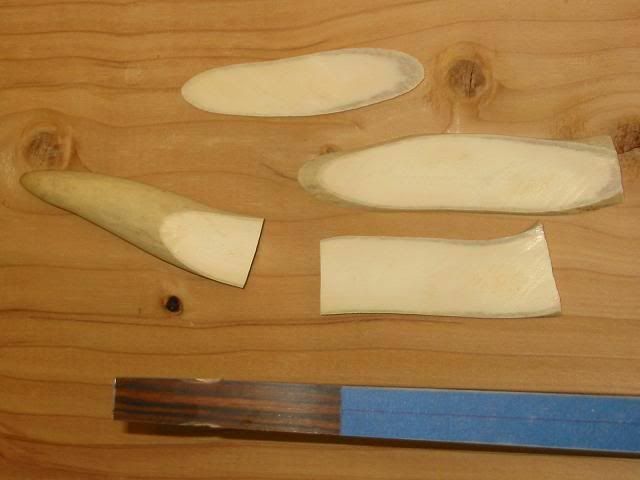 I began shaping the tips. 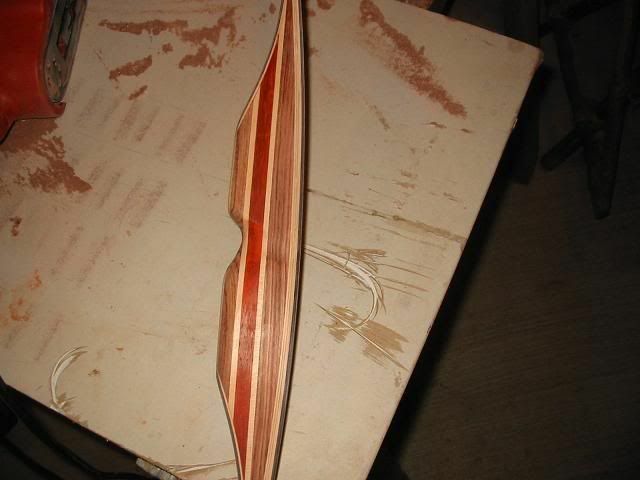 I still have the very first fiberglass longbow I ever owned as a kid. 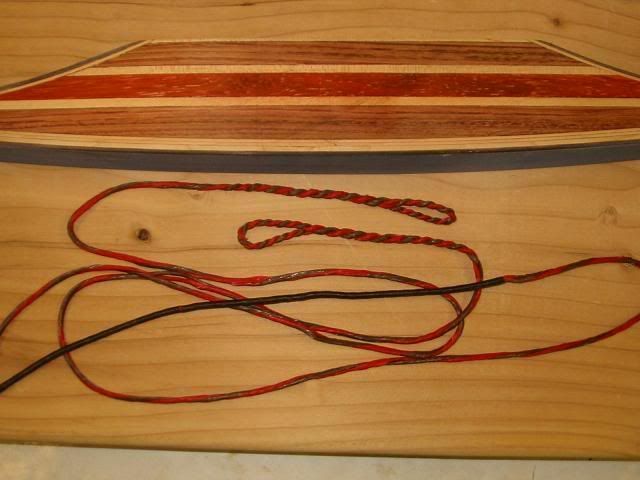 It is a 25 pound bow and I wanted to make the tips of the new bow look something like my old bow. 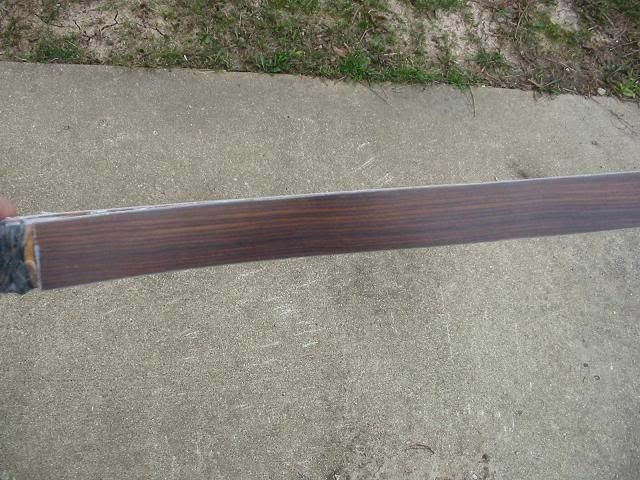 I sanded all the edges flush and continued the string grooves I had already started. The rest really needs no explanation. 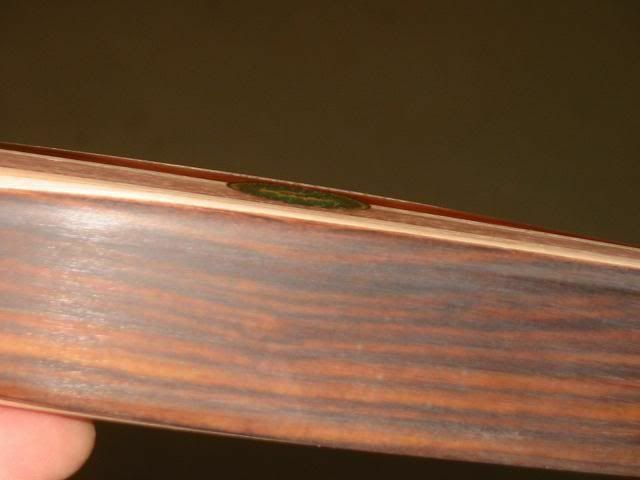 The groove has to have enough room so the string does not kink at full draw. 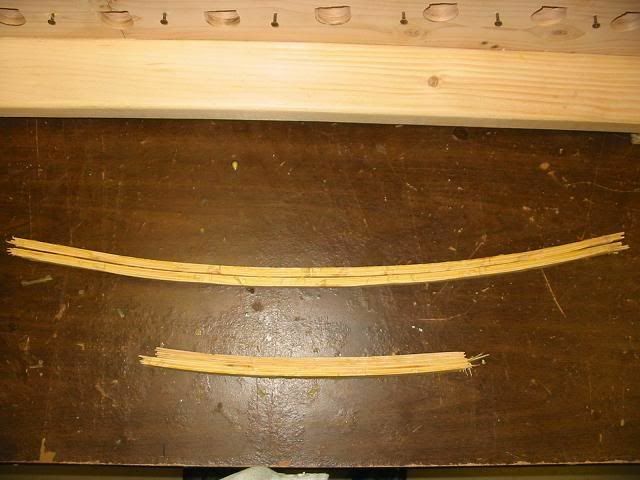 I used the good end of the broken string and approximated the string angle. It's a slow process and one I spent much time on. I did get a replacement string from a very kind young man on a traditional archery site where I have been keeping this same blog. 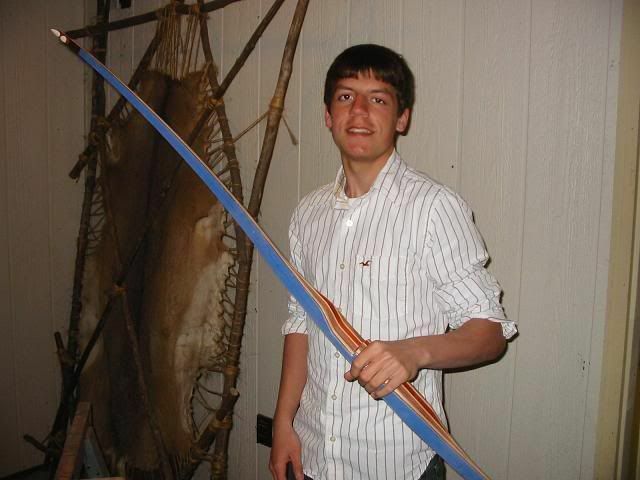 He sent not one but two strings for Josh's bow. I offered to pay him and he would hear nothing of it. Trad folks are really good people. He even matched the colors of the riser. 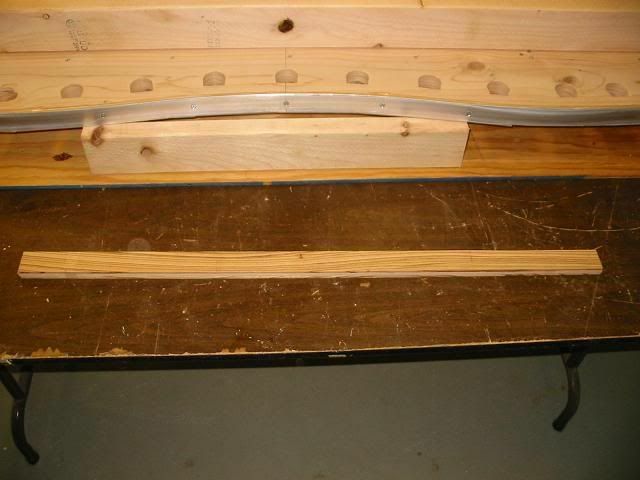 Before I could use the new string, I needed to build a tillering tree to check the limbs for even bending. 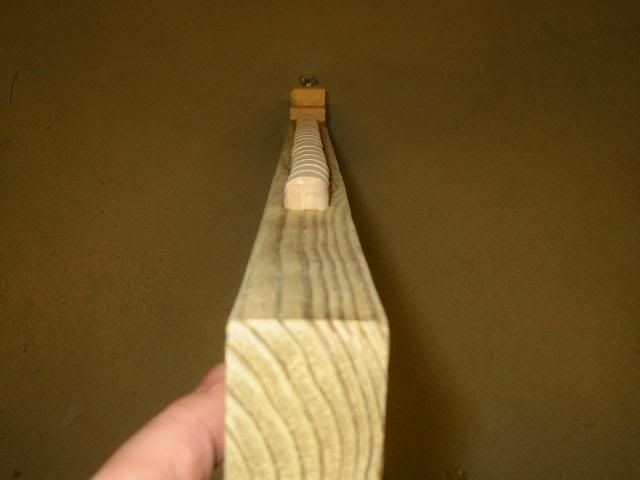 I had a section of treated 2x4 up in the rafters of my garage for a few years so I knew it was good and dry. 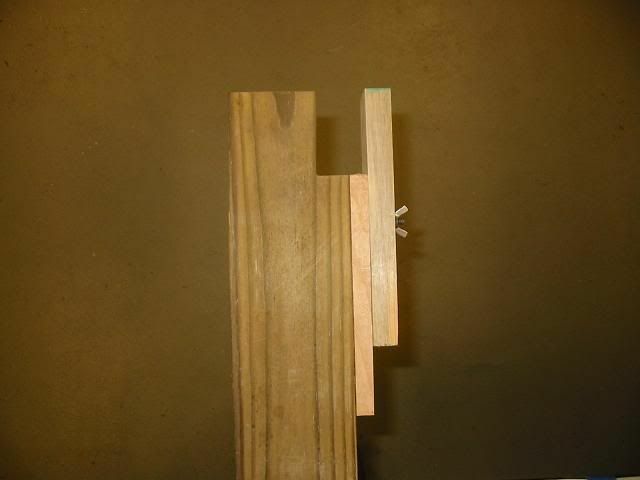 I drilled a series of 3/4" diameter holes at a 15 degree angle in the edge of the 2x4. The holes are 2 1/2 inches deep. 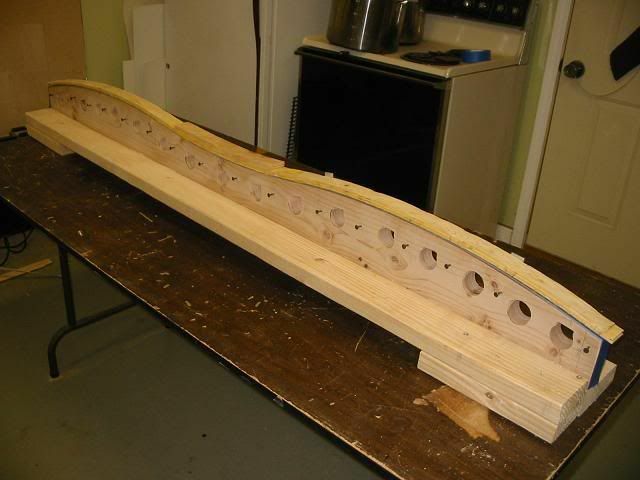 In those holes, I glued short sections of 3/4 inch wooden dowels. 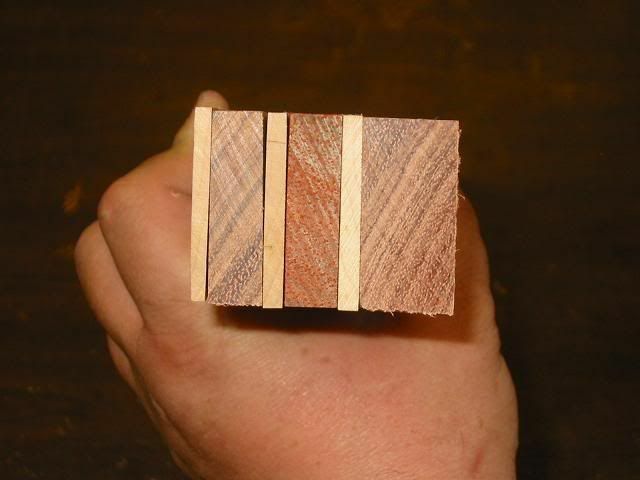 I then sanded them to round off any sharp edges. And marked off the distances along the side. 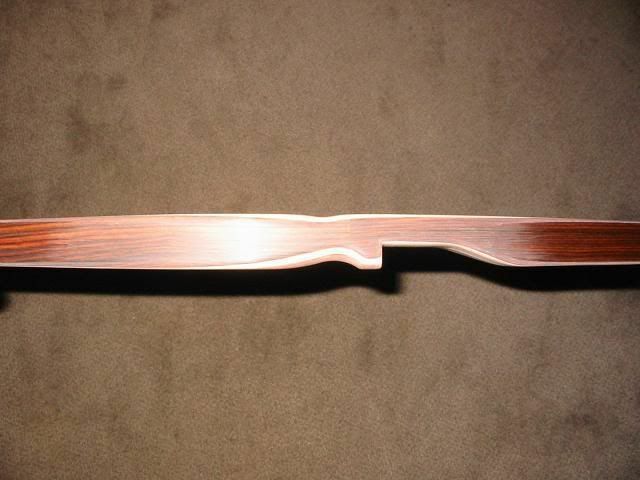 This is the bow holding end of the tree. 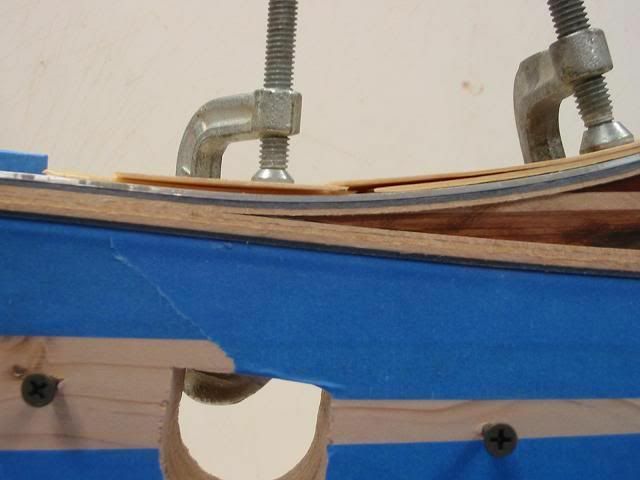 I use a piece of leather to protect the riser when I clamp the bow in place. I attached a plywood base so it would stand by itself. 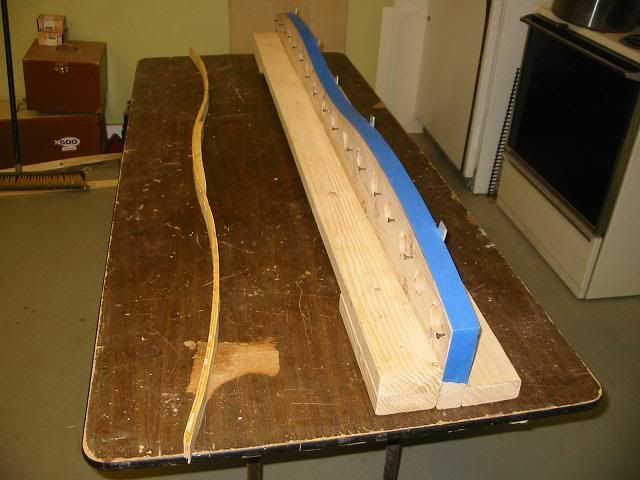 With the string grooves filed and the tillering tree finished, I strung the bow for the first time. and drew it back. It was a good feeling. 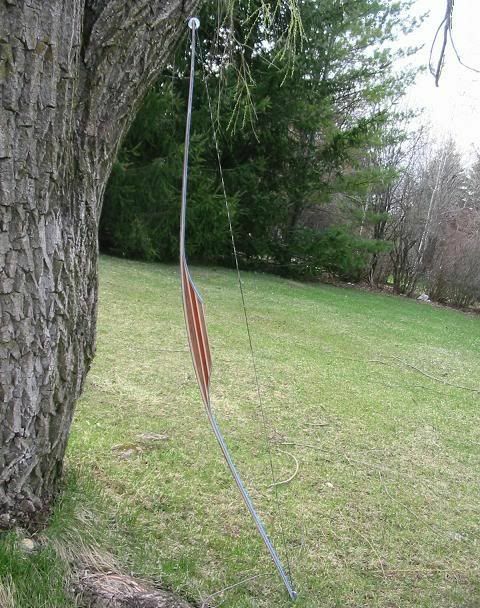 I then put it in the tree and drew the bow to a few different lengths to see if the limbs were flexing equally. Here are the pics. I can see some differences in the flex of the limbs. I will sand away certain areas to make the limbs act the same. Lessons learned. 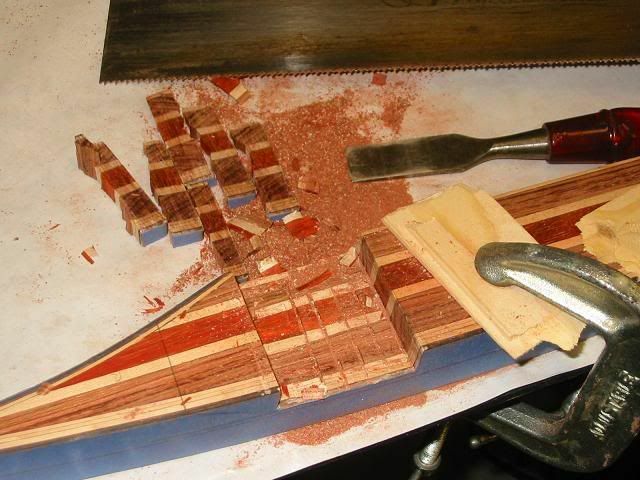 I could have left out every other wooden peg. I really don't need one at every inch. 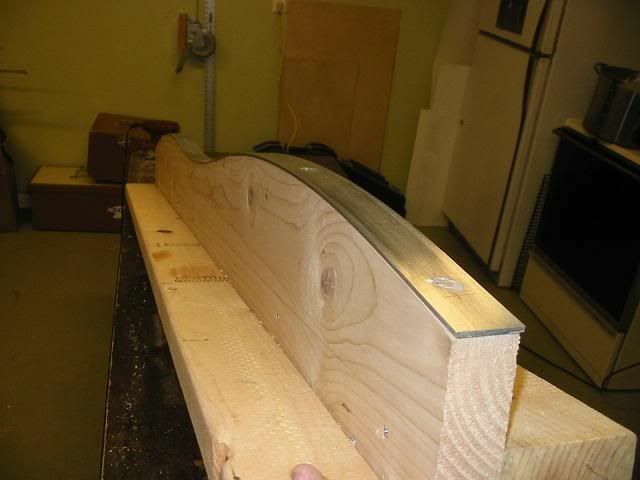 Next, I cut out the sight window and shape the grip. 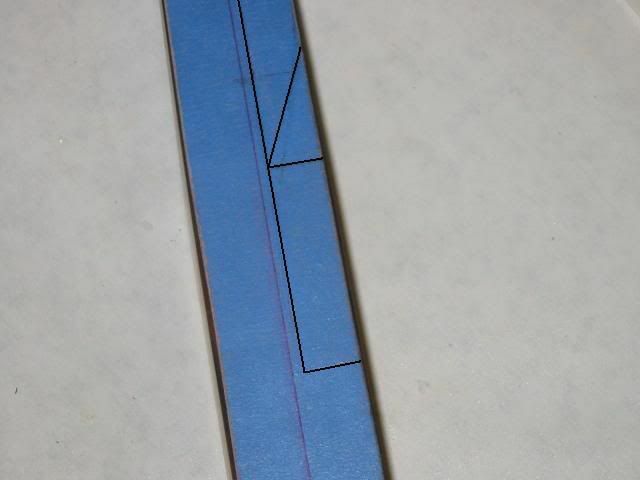 I drew the window onto the tape on both the back and belly of the bow. 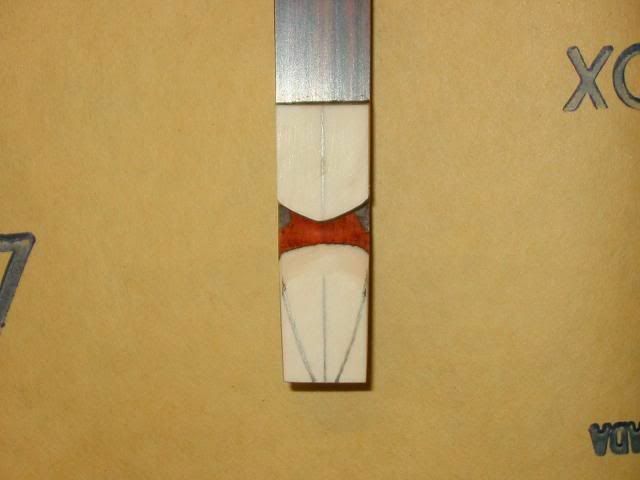 The window will be 1/8th inch less than center. I used a hand saw and chisel to remove the wood. And then sanded it to the lines. I put a crown on the shelf. It still is a bit thick and will need to be slimmed down a bit. The end user is happy with the fit so far. 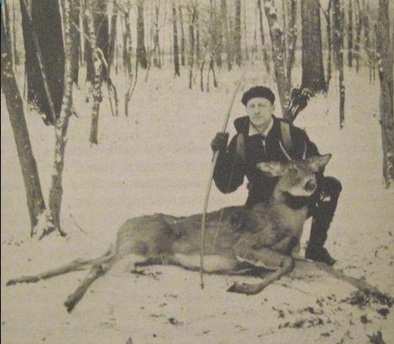 I strung the bow and used an arrow marked at 28 inches. Drawing it on a scale produced 48 pounds of draw. After stringing the bow and having Josh draw it a few times, I asked him how the grip felt. He didn't like the bump in the center of his palm so I sanded it down a bit more and did all the finish sanding of the rest of the grip. 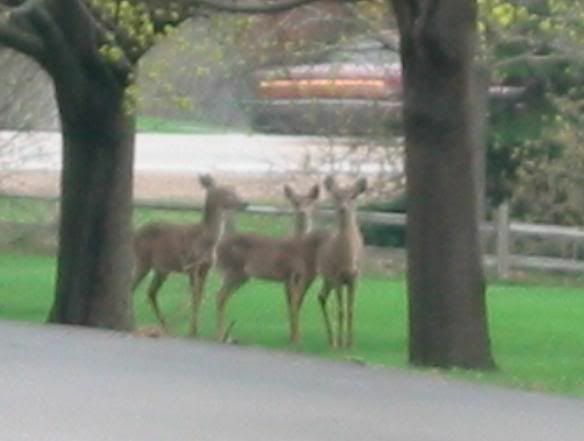 While I was hand sanding, I looked up to see 3 young gals heading up the driveway to visit. I stopped sanding and grabbed the camera. They didn't hang around long after I told them what I was making. 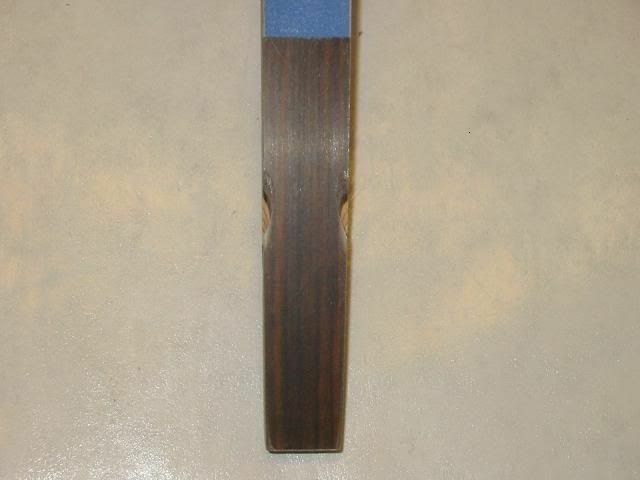 With the sanding done (320 grit) I masked off the riser leaving the bloodwood exposed. 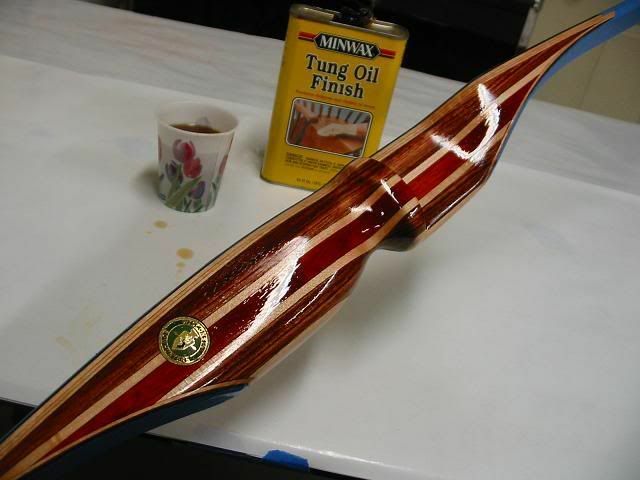 I cleaned it with denatured alcohol in preparation for sealing the oily bloodwood with super glue. 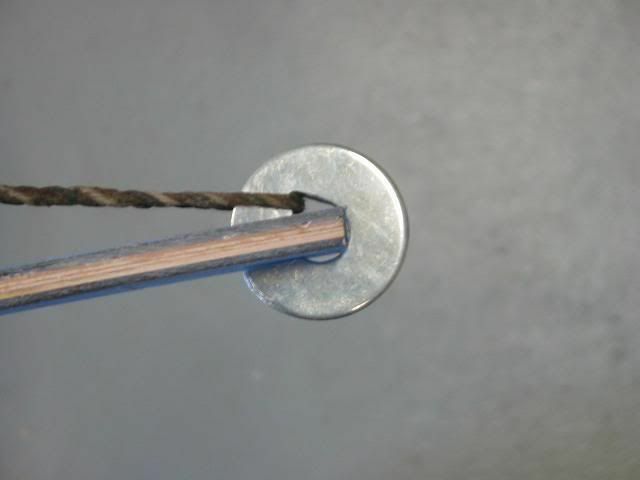 I squeezed a line of glue on the wood and worked it in with my index finger using a circular motion and made sure not to stop long enough to become fused to the bow. The Super glue gives a nice shiny acrylic finish and seals and files the pores. After a 20 min. 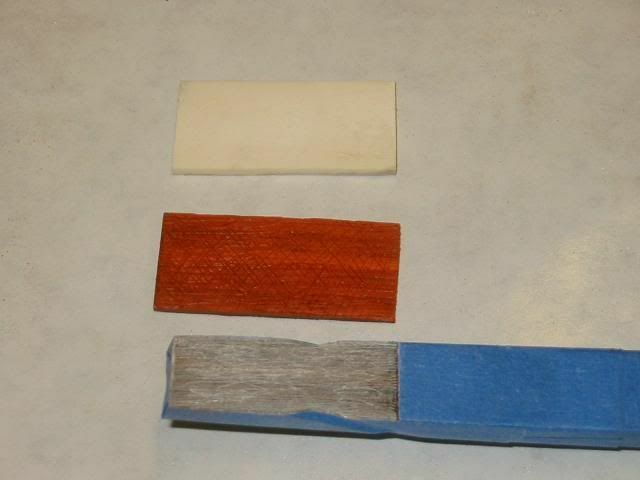 dry time, I peeled the tape and used 320 and the 400 grit sandpaper (including the glass) to take off the shine and smooth out the glue. 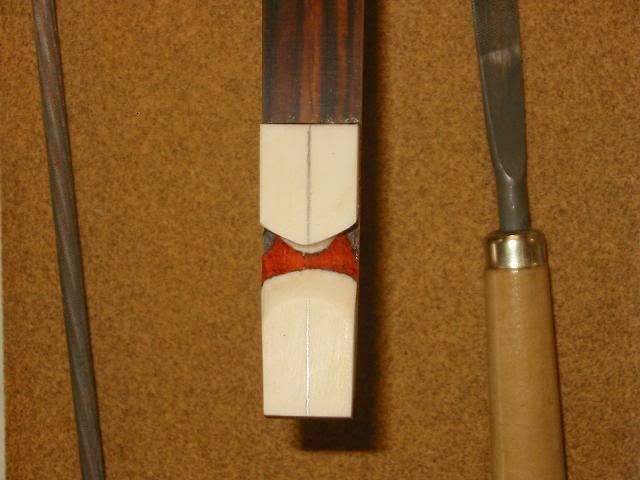 The bloodwood is now sealed and now will accept the finish and dry at the same rate as the rest of the woods in the riser. 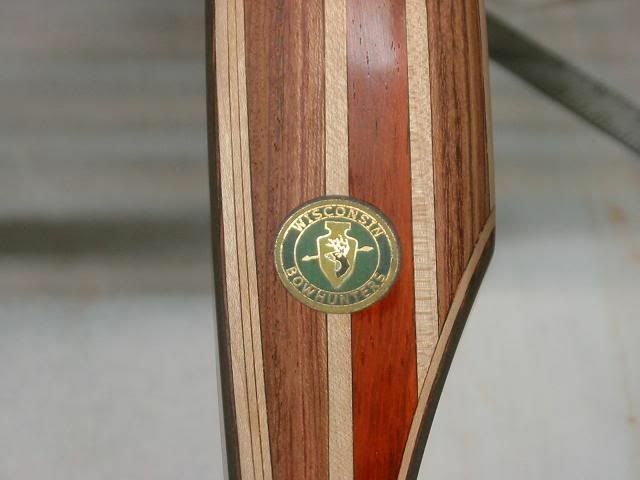 I wanted to add a medal to the bow's riser so I used a hat/lapel pin that I got at the last Wisconsin Bowhunter's Annual convention. Being that I was a Director for the WBH at the time of the build, I though it would be a nice touch. I drilled a shallow hole for the medal so that it would sit below the surface of the riser. I then masked off the riser and cut away the tape covering the hole. I used two layers of tape so that when I used a putty knife to level the epoxy, It would sit just higher than the riser and allow me material to sand away to make flush. 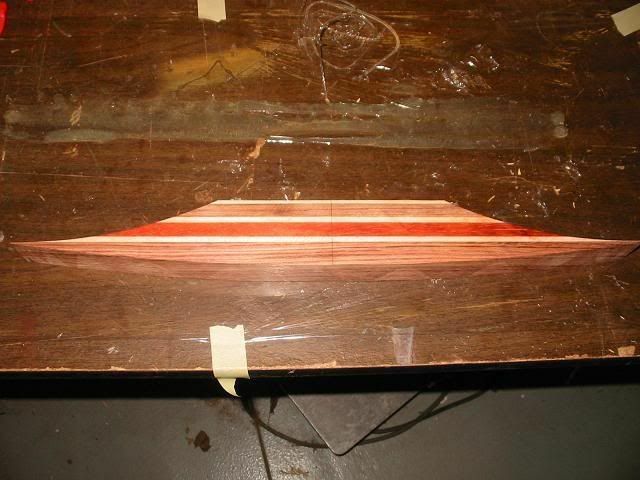 When the epoxy cured, I sanded it so the epoxy was level with the wood. 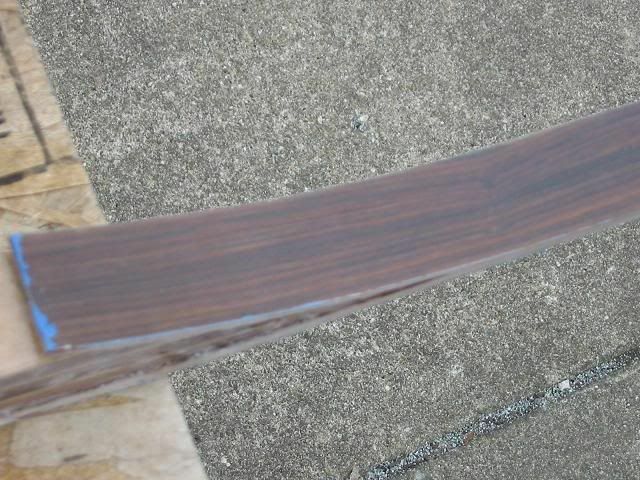 I kept on sanding until I had the whole bow smooth with 320 grit sandpaper. 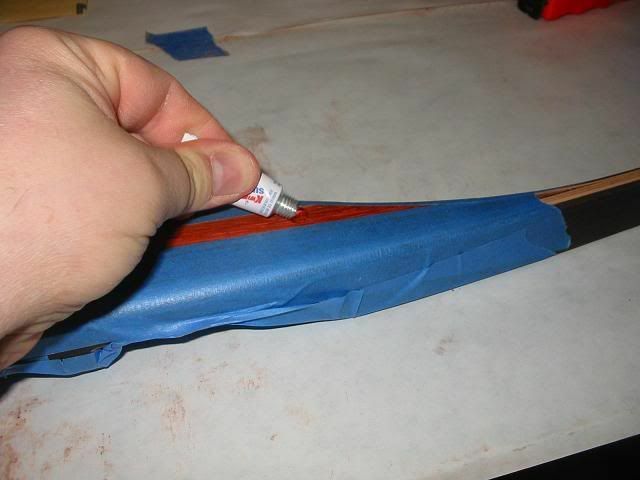 I then cleaned the bow with a tack rag and then wiped it down with denatured alcohol. I masked off the glass because I want to finish the riser with tung oil. 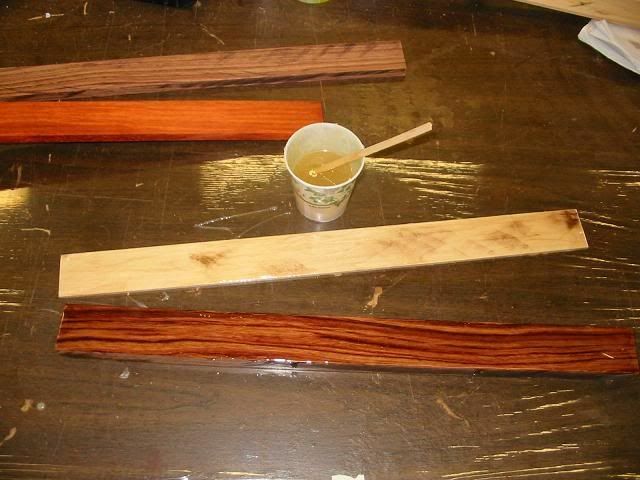 I applied the Tung oil using the same "Brush" I used to apply the super glue to the bloodwood. 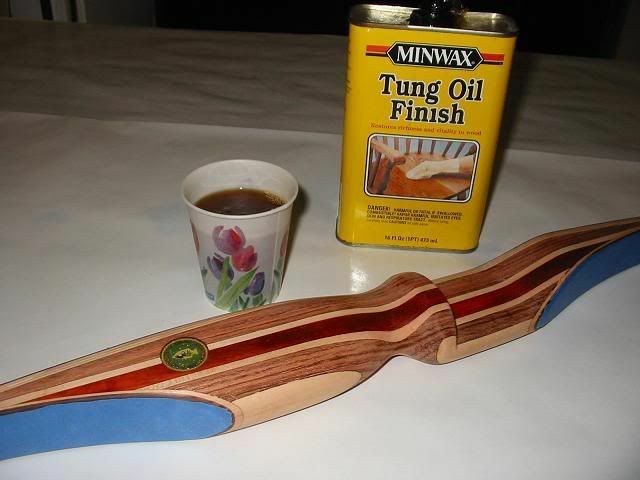 I rubbed in a healthy dose of the tung oil and after it cures, I will give it two more coats. I will then use 400 grit and steel wool to smooth out any lines and give it two more coats.